Having returned Neil and Buzz to the safety of an initial lunar orbit, Eagle goes through various manoeuvres to rendezvous with Columbia. Mike takes over when the two craft are a few yards apart and docks Columbia to Eagle. Astronaut Ron Evans is in the CapCom seat in Mission Control. 16-mm film magazine H shows the ascent from the Moon as taken from Buzz's window. Unfortunately, he started the camera just after lift-off so Eagle's ascent stage is already in flight at the start of the film. 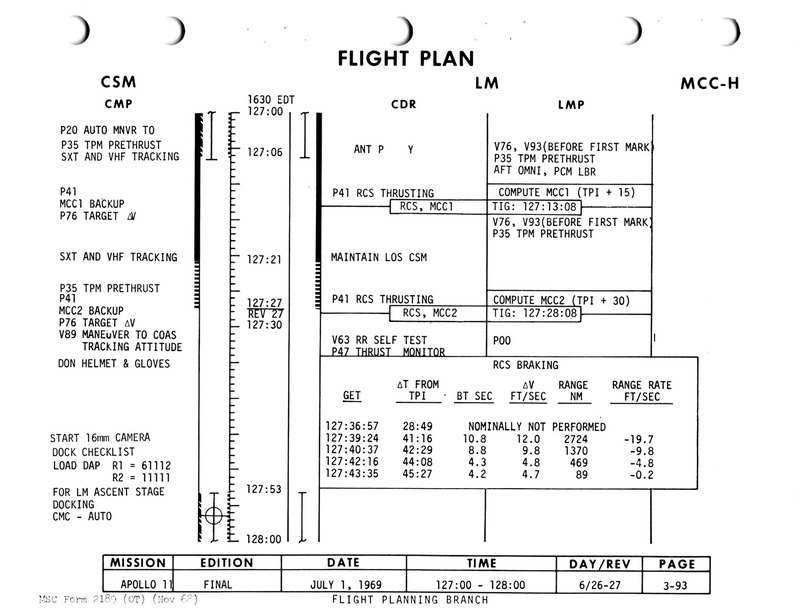 The Apollo 11 Flight Journal picks up the mission at the moment of shutdown of the ascent engine and their injection into orbit. The first two minutes or so of this page is an overlap with the end of the Apollo 11 Lunar Surface Journal. 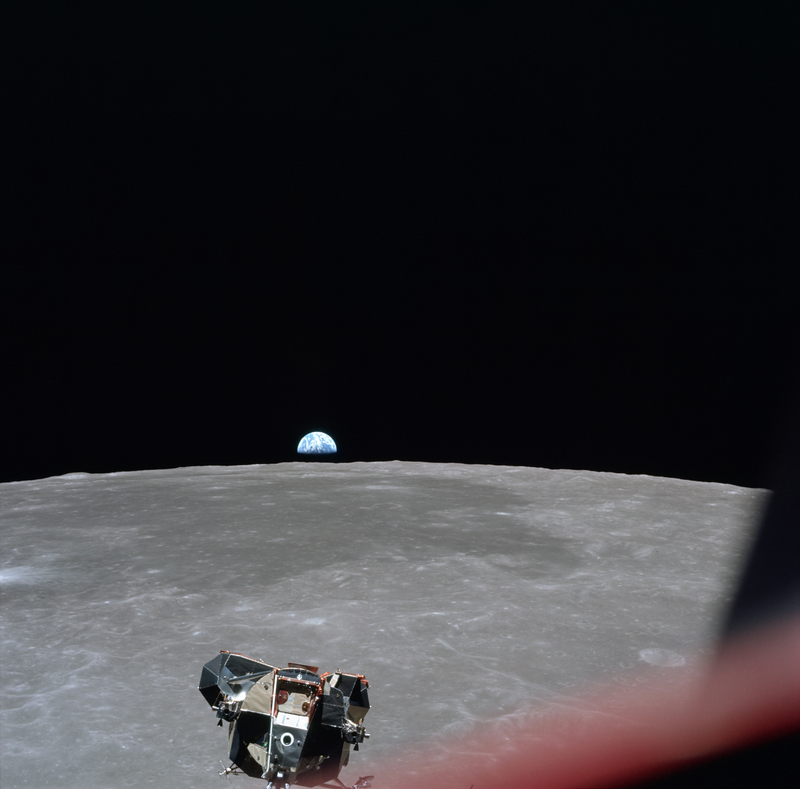 124:29:23 Aldrin: We got 5,337.3 [feet per second horizontal velocity, 1,626.8 m/s], 32.8 feet per second [vertical velocity, 10.0 m/s], 60,666 [feet, 1849.1 metres altitude]. 124:29:33 Evans: Eagle. Roger. We copy. It's great. Go. 124:29:40 Armstrong (onboard): Okay. Take those out, right? 124:29:50 Evans: Eagle, Houston. Trim residuals. They will use the RCS to refine their orbit by making three-axis velocity corrections to exactly the desired values. Public Affairs reports that they are in a 9.1 by 47.2 nautical-mile orbit. 124:30:40 Armstrong (onboard): [Garble] check that residual. 124:30:45 Collins: Eagle, Columbia. You got a solid lock on in VHF ranging and a fresh estimate of R-dot [rate of change in range, the rate of approach] is 480 feet per second [146 m/s]. 124:30:53 Armstrong: Okay. That sounds a little on the high side. 124:30:57 Collins: Yeah. I'll update it here shortly. 124:31:00 Aldrin: Okay, Houston. We show 47.3 by 9.5 [nautical miles, 87.6 by 17.6 km]. These are the high and low points of their present orbit. 124:31:07 Evans: Roger. 47.2 by 9.5. 124:31:14 Aldrin: The AGS has 9.5, 46.6 [nautical miles, 17.6 by 86.3 km]. Having just queried the PGNCS about the size of their orbit, Buzz has asked the AGS for its determination. PGNCS: 47.3 by 9.5 nautical miles (87.6 by 17.6 km). AGS: 46.6 by 9.5 (86.3 by 17.6 km). The two systems with their independent gyros and accelerometers are in remarkable agreement. 124:31:44 Evans: Eagle, Houston. Request abort stage, reset; engine stop, reset; and mode control to Att Hold when you get a chance to. 124:32:16 Aldrin (onboard): You want to try...? 124:32:23 Aldrin (onboard): Circuit breakers in - or do you want to go to align? Here in Mission Control the scribing plotter showing the velocity and height - here we go again. 124:32:44 Evans: Eagle, Houston. You can go ahead and proceed with P52 as per nominal. 124:32:52 Armstrong: Roger, Houston. The Eagle is back in orbit, having left Tranquillity Base and leaving behind a replica from our Apollo 11 patch and the olive branch. Now that they have achieved the planned orbit, the job of the LM crew is to perform a rendezvous with Mike in the CSM. This is an extraordinary feat given that this is early in the days of space travel before there were sophisticated navigation systems in place. The Eagle's tiny ascent stage has very limited propellant left and must carry out the upcoming manoeuvres accurately in order to reach Columbia. The techniques for doing so were repeatedly practised and refined in Earth orbit during Project Gemini in the mid 1960s. Apollo 10 then rehearsed them in lunar orbit two months previously. All three crew flew on Gemini missions that included a rendezvous and in a sense, Buzz wrote the book on the subject having submitted a thesis on the subject. At this stage of the mission, NASA is in familiar operational territory. A full explanation of Lunar Orbit Rendezvous is contained in Frank O'Brien's essay on the subject but here is a shortened version. 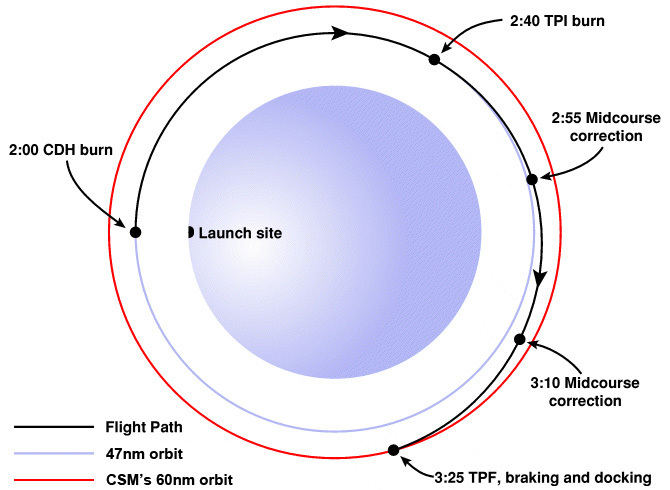 From launch to rendezvous requires nearly two orbits and 3½ hours to complete and used a technique known as the 'coelliptic' method. This is a steady, careful, step-by-step approach that was chosen because it is inherently forgiving of small navigation errors. As the Apollo programme matures, later missions will exploit ways of shortening the process. Diagram of the first 2-hour orbit in the coelliptic sequence of rendezvous. The process began with launch from the lunar surface and injection into a 47.3 by 9.5 nautical mile (87.6 by 17.6 km) elliptical orbit. After about an hour, Eagle will reach its apolune at which point it will circularise its orbit to be about 50 by 46 nautical miles (92.5 by 85 km). 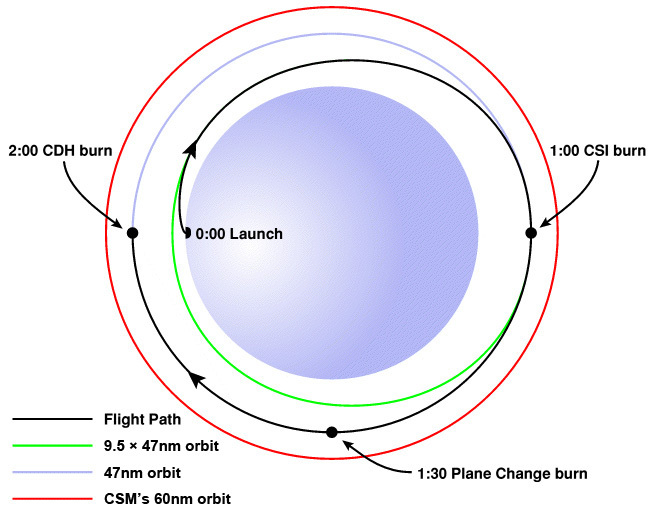 Half and hour and quarter of an orbit later, there is an opportunity set aside for a burn to adjust the plane of the LM's orbit to match that of the CSM. In Apollo 11's case, they will decide that the two planes are close enough and the plane change burn will not be carried out. Next, having completed a full orbit, the LM will perform a burn to achieve a Constant Delta Height with the CSM, the CDH burn. What this does is to shape the LM's orbit be the same as the CSM's so that the two orbits are constantly 15 nautical miles (28 km) apart. Diagram of the remaining ¾-orbit and 90 minutes of the coelliptic sequence. After the CDH burn, the crew have about 40 minutes during which they can track the CSM and use their measurements to calculate a burn for the final or terminal phase of the rendezvous. This burn is called Terminal Phase Initiation or TPI and it sets the LM on a near intercept trajectory that lasts for about 130° of a revolution. If this burn is accurate, then even as they both coast in their curved paths around the Moon, the LM will approach the CSM in a straight line with respect to the stars. Indeed, the stars are used as a visual reference so this phase is timed to occur over the night time side of the Moon. By checking to see if the CSM appears to drift with respect to the stars, the LM can correct its approach. The final approach and braking manoeuvres, known as Terminal Phase Final or TPF, are carried out after the two spacecraft return to daylight. 124:33:27 Aldrin (onboard): We're going to have to have our rendezvous radar circuit breakers in anyway to get on to your link. 124:34:09 Aldrin (onboard): Inverter 2, Inverter 1, circuit breaker open? 124:34:09 Collins: Columbia's re-acquired you. 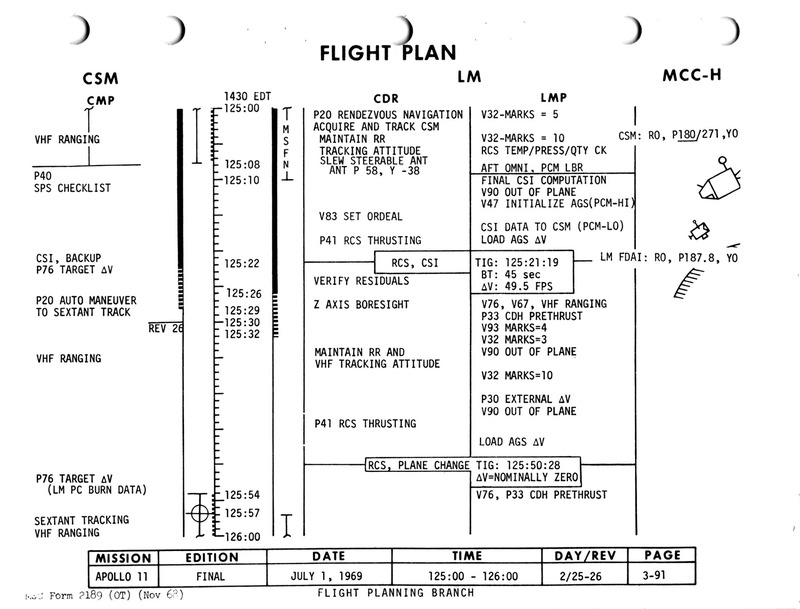 Here in Mission Control, the scribing plotters have been replaced with the lunar orbit tracking chart showing Eagle behind Spider [means Columbia] some 20 degrees in longitude. Flight Operations Director Chris Kraft commented that he felt like some 500 million people around the world are helping push Eagle off the Moon and back into orbit. We're continuing to monitor transmissions between the ground and Eagle and Columbia. Apollo Control standing by. 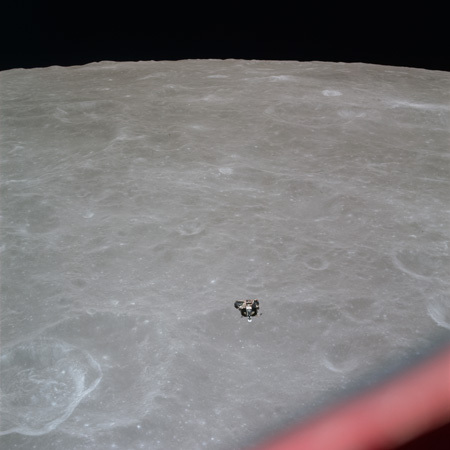 The PAO has slipped up in saying Spider, the code-name of the Apollo 9 LM, when he means Columbia, the Apollo 11 CM. 124:34:11 Armstrong (onboard): I got Inverter 1. 124:34:44 Armstrong (onboard): Going to Track here. 124:34:52 Armstrong (onboard): That right? 124:35:19 Armstrong (onboard): You know, I didn't see a lot of dust in the cockpit, did you? 124:35:22 Aldrin (onboard): No, there was a fair amount. What did you get, 283? 124:35:23 Evans: Columbia, Houston. Request P00 and Accept, and we'll give you a good ole LM vector. Over. 124:35:37 Collins: Roger. Houston. Going to Accept. 124:37:29 Evans: Eagle, Houston. You can go ahead and turn your Up-Datalink switch off. 124:37:39 Aldrin: Roger. It's off. This is Apollo Control. During the ascent phase, the heart rates on the Eagle crew reached 90 for Neil Armstrong, 120 for Buzz Aldrin. They're now back down in the 80s. We're some 28 minutes, 15 seconds from Loss Of Signal with Columbia; 29 minutes, 52 seconds away from Loss Of Signal on Eagle. 124:39:06 Evans: Columbia, Houston. The computer is yours. Press on. 124:39:24 Aldrin: Houston, the AGS has a Delta-H of 15.5. 124:39:31 Evans: Eagle, Houston. Roger. 15.5. 124:39:33 Aldrin: And a maneuver of - and a maneuver of 51.3. 124:39:41 Evans: Roger. We copy. And, Eagle, aft Omni. Over. 124:41:20 Aldrin: Roger. It's on. Buzz is discussing the LM's tracking light with Mike. 124:42:51 Aldrin: 37, I believe. 124:47:11 Aldrin: I got [garble]. 124:48:06 Armstrong: Roger. Go ahead. 124:48:24 Armstrong: Okay. It's closed. 124:48:26 Evans: Roger. And we've got about 1 minute to before where you ought to be radar tracking, and we've lost data with you. 124:49:42 Collins: Eagle, Columbia. You can turn your track light off. 124:49:46 Aldrin: Okay. You got it? 124:49:50 Aldrin: All ready to mark, X and Y. Okay. Marked X now. 124:50:02 Aldrin: X or Y? Maybe we ought to be satisfied with three of them. 124:50:15 Collins: Eagle, Columbia. Your track light still on? 124:50:22 Aldrin: That light is still on. 124:50:25 Aldrin: X or Y? 124:50:54 Aldrin: Okay. Mark Y.
Neil has just performed what will be the final platform realignment for Eagle's IMU. For this, he used the technique of manoeuvring the LM in order to cause his chosen stars to pass over the X and Y lines that he can see through the AOT's eyepiece. The stars used were star 12 (Rigel, Beta Orionis) and star 25 (Acrux, Alpha Crucis). The amount by which the gimbals had to be rotated to restore alignment were -0.006° in X, +0.064° in Y and +0.137° in Z. Neil's star angle difference for this exercise was zero, a perfect score. It meant that the measured angle between the two stars was the same as the actual angle between them based on their stored positions. 124:51:57 Collins: I got a [garble] mark on [garble] track light [garble] drive you right in the middle [garble] attitude about that time. 124:52:13 Aldrin: ...breaker in? Both circuit breakers in? 124:52:18 Collins: Eagle, Columbia. I got a solid mark on [garble] the ranging [garble]. 124:52:26 Aldrin: Okay. Auto maneuver. 124:52:36 Collins: Okay, I got your track light back. Thank you much. 124:53:01 Aldrin: Houston, Eagle. Did you copy our star angle difference and torquing angles. 124:53:07 Evans: Eagle, Houston. We didn't have them on the downlink but we copied them on the Vox. 124:53:18 Aldrin: Okay. It was zero for star angle difference, minus 06, plus 64, and plus 1.37. Over. 124:55:54 Aldrin: Engine arm circuit breaker. These are angles to which the steerable dish antenna can be aimed in an effort to improve communications. 124:58:32 Aldrin: You load the REFSMMAT? Okay. 124:58:36 Collins: Eagle, Columbia. Your Y-dot is minus 1.0. Over. 124:58:44 Armstrong: Mike, you're [garble]. 124:59:04 Collins: Eagle, this is Columbia. Over. 124:59:10 Collins: Houston, Columbia. Over. 124:59:12 Evans: Roger, Columbia. Loud and clear now. This is Houston. 124:59:17 Collins: Roger. Would you tell Eagle his Y-dot is minus 1.0. Over. 124:59:24 Evans: Roger. Eagle, Columbia says your Y-dot is minus 1.0. Over. 124:59:37 Armstrong: Roger, Houston. We got that. Thank you. 125:00:44 Aldrin: AGS agrees very closely, and pointing [garble] direction. 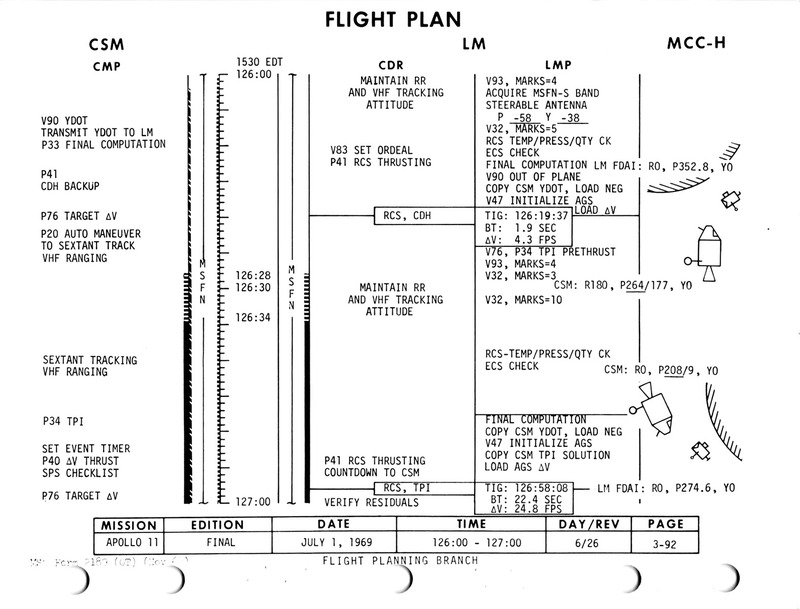 125:00:57 Collins: Houston, Columbia is unable to read Eagle on either antenna or on VHF duplex Bravo. You got any suggestions? 125:02:00 Aldrin: Okay. Wide deadband on. 125:02:04 Collins: Houston, Columbia. Also my VHF ranging is not working now, and I'd like to know whether you'd like me to continue making sextant marks or do nothing. I'm supposed to be doing VHF marks only, and it's for the next 6 or 7 minutes. 125:03:15 Collins: Roger, Houston. Columbia's got the VHF ranging back now. I'll stick with the nominal. Thank you. 125:03:38 Collins: Columbia reading you loud and clear now, Eagle. 125:05:00 Collins: Go ahead, Houston. 125:05:02 Evans: Roger. Mike, you can go ahead and get as many VHF and sextant marks as you can here in this period of time. 125:05:57 Evans: Eagle and Columbia, about 1 minute to LOS there on Columbia. It looks like we have about 51.5 for CSI, and we tend to confirm your Y-dot. And, break. For Eagle, verify VHF Bravo transmitter is off. The ground's computation of the CSI maneuver is 51.5 feet per second (15.7 m/s) which, as Neil will reveal on the onboard recording, equals the solution in the LM. 125:06:22 Aldrin: Roger. VHF Bravo is off. 125:06:35 Evans: Eagle, Houston. Recommend aft Omni and are you Go for CSI, so we can let Columbia know. Over. 125:06:47 Aldrin: Roger. We're Go for CSI. 125:06:52 Evans: Columbia, Houston. Did you copy? Eagle is Go for CSI. 125:06:58 Collins: No, I did not copy. I'm reading them only intermittently, but thank you. This is Apollo Control. Columbia has gone behind the Moon. Still a little over a minute left until Eagle goes behind the Moon. We'll catch these last few minutes of tracking and any possible conversation. 125:07:39 Armstrong (onboard): No. We'll wait until CDH. 125:08:09 Evans: Eagle, Houston. We'll see you coming around the other side. Your AOS times are 1 minute ahead of the Flight Plan. 125:08:18 Armstrong: Okay. Thank you. 125:09:31 Armstrong (onboard): No, I didn't. Go ahead, Mike. 125:09:39 Armstrong (onboard): I think we are now, finally, and I think I have you in sight. This is Apollo Control. We have had Loss Of Signal with Eagle. Quite scratchy as Eagle went over the hill to complete the 25th lunar revolution as it gets to the midpoint on the lunar far side. Ascent burn just completed went quite well; on time at 124 hours, 22 minutes, 0 seconds Ground Elapsed Time. Coming up on this rev, approximately 10 minutes from now as a matter of fact, will be the Concentric [also known as 'Coelliptic'] Sequence Initiate maneuver, CSI, which will raise the Eagle's perilune to some 45 nautical miles. Eagle now is in an orbit measuring 9.4 nautical miles [17.4 km] at insertion or perilune, and 46.7 [86.5 km] at apolune. This CSI maneuver will be made approximately at apolune. Therefore, the effect takes place 180 degrees later and has the effect of raising perilune to the desired 45 nautical miles [83.3 km]. This maneuver will take place at 125 hours, 19 minutes, 34.7 seconds. He will have a Delta-V or velocity change of 51.5 feet per second [15.7 m/s]. All of these maneuvers, incidentally, in the rendezvous sequence by Eagle, will be made by the - using the Reaction Control System of Eagle. Following the CSI; at 126 hours, 18 minutes, 0 seconds; a 9.2 foot per second [2.8 m/s] burn, probably mostly a radial burn; at 126 hours, 18 minutes will twist the Eagle's orbit to equal distance from the orbit of Columbia, what they call a Constant Delta Height, or CDH maneuver. At 126 hours, 57 minutes, 00 seconds; Terminal Phase Initiate, TPI. In this maneuver, the crew visually thrust along the line of sight toward Columbia when the line of sight is some 27 degrees above the local horizontal. This maneuver will have a magnitude of about 24.9 feet per second [7.6 m/s], and, in turn, it raises the apolune to 60.5 nautical miles [112.0 km], which is approximately the altitude Columbia is orbiting. Terminal Phase Finalization, TPF; 127 hours, 39 minutes, 39.2 seconds. This is the start time for a series of small burns which are a combination of midcourse corrections and velocity match maneuvers to bring Eagle in with Columbia and match the velocity so that they station-keep for a short period for photography, etc., and move on into docking at approximately 128 hours Ground Elapsed Time. In all of these maneuvers, Mike Collins aboard Columbia is spring loaded to do what is called a mirror image maneuver approximately a minute after the Eagle is scheduled to make its maneuver, and if for some reason Eagle cannot make the maneuver, Collins would do the exact same maneuver only in reverse so that Columbia would in effect begin a CSM-active rendezvous with Eagle. As Eagle went over the hill on the 25th revolution, a velocity was being measured at 5,410 feet per second [1,649 m/s]. Eagle's weight somewhat lighter than when it started out in excess of 32,000 pounds [14,500 kg] - it's now shrunk to some 5,885 pounds [2,669 kg]. Some 39 minutes, 20 seconds away from acquisition of Columbia; 41 minutes, 45 seconds from acquisition of Eagle; as the two vehicles come around on the 26th lunar revolution. The crew will likely describe how the CSI burn went, which is some 5 minutes away from this point. And at 125 hours, 14 minutes Ground Elapsed Time, this is Apollo Control. 125:09:57 Armstrong (onboard): We have 51.5. 125:10:19 Armstrong (onboard): Well, the ground's got 51.5, and we got 51.5. Yes. First time we've ever agreed on anything. 125:10:41 Aldrin (onboard): Want these [garble] first? 125:10:43 Armstrong (onboard): Not yet. 125:10:45 Aldrin (onboard): I don't know why. 125:11:17 Aldrin (onboard): I had to turn my S-band off so I could hear him - my S-band switch on the audio panel. Woo-woo! 125:11:31 Armstrong (onboard): Yes, that works good. 125:11:51 Aldrin (onboard): Not at this point, no. 125:13:11 Aldrin (onboard): [Garble.] Hey, Mike, how do you read me? 125:13:24 Aldrin (onboard): Okay, let's go to B Data on your command. The B channel of their VHF radio system allows engineering and systems data to be sent from the LM to the CSM to be recorded on the DSE tape recorder for later transmission to Earth. 125:13:59 Collins (onboard): Eagle, Columbia. 125:14:06 Aldrin (onboard): Loud and clear. 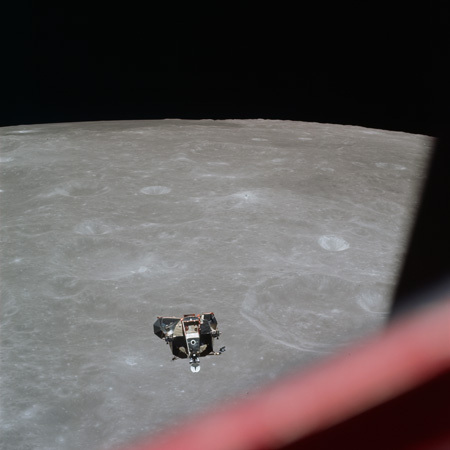 125:14:10 Aldrin (onboard): Affirmative; we're at the burn attitude, too. 125:15:10 Collins (onboard): Eagle, Columbia. When you get a chance, could you give me the - the CSI P76 PAD and your Noun 84 and your Noun 33? 125:15:21 Aldrin (onboard): Yes, we'll do that in a minute. 125:15:50 Aldrin (onboard): Okay, Mike, you want the burn time and the Noun 81. Is that right? 125:16:00 Aldrin (onboard): Okay, the burn time is 125:19:34.7, and the burn is 51.5, zero, and zero. 125:16:16 Collins (onboard): Okay, I understand. Plus 51.5, zeros, and zeros, and you're using 125:19:34.70. Thank you kindly. 125:18:45 Collins (onboard): I'm in maneuver attitude, all set to burn if necessary. I've got about 45 minutes to TIG - 45 seconds to TIG. As mentioned above, ignition for the Coelliptic Sequence Initiation (CSI) burn is at 125:19:34.70. 125:19:46 Aldrin (onboard): We're burning, Mike. 125:21:36 Aldrin (onboard): Burn complete, Mike. 125:21:39 Collins (onboard): Good show. 125:22:59 Aldrin (onboard): Okay, Mike, our CDH time is 126:17:45.58. Over. 125:23:12 Collins (onboard): Roger, copy. CDH, 126:17:45.58. 125:28:33 Collins (onboard): Eagle, Columbia. I have you in an orbit 49.5 by 46.1 [nautical miles, 91.7 by 85.4 km]. 125:28:43 Aldrin (onboard): Okay, thank you. 125:29:09 Collins (onboard): Eagle, Columbia. I'd like to go back to VHF Ranging configuration, please, on your mark. 125:29:17 Aldrin (onboard): Mark, VHF Ranging. 125:30:40 Armstrong (onboard): Well, which way did I go? 125:30:42 Aldrin (onboard): [Garble] out of plane. 125:30:46 Aldrin (onboard): Did you hear that? 125:30:57 Aldrin (onboard): Why you don't hear these 3 - 3,500-pound rocket engines when you're sitting on them, I'll never know. Most of the noise we associate with a rocket engine is produced by the violent and turbulent interaction of the exhaust gases with the atmosphere through which they flow. However, in the LM, the gases are expelled straight into a vacuum. What little noise there is comes from the flame front within the engine and the vibrations it produces which can travel through the structure. There aren't even any pumps whirring or vibrating to add to the noise. On Apollo 15, David Scott commented that the ascent engine sounded 'like the wind whistling'. 125:31:08 Aldrin (onboard): [Garble] structure somehow. 125:31:31 Aldrin (onboard): 3.5, Neil. 125:32:48 Armstrong (onboard): [Garble] B? 125:32:50 Aldrin (onboard): Not on A. 125:32:58 Armstrong (onboard): [Laughter.] That's your story, huh? 125:33:25 Armstrong (onboard): That's rugged country. 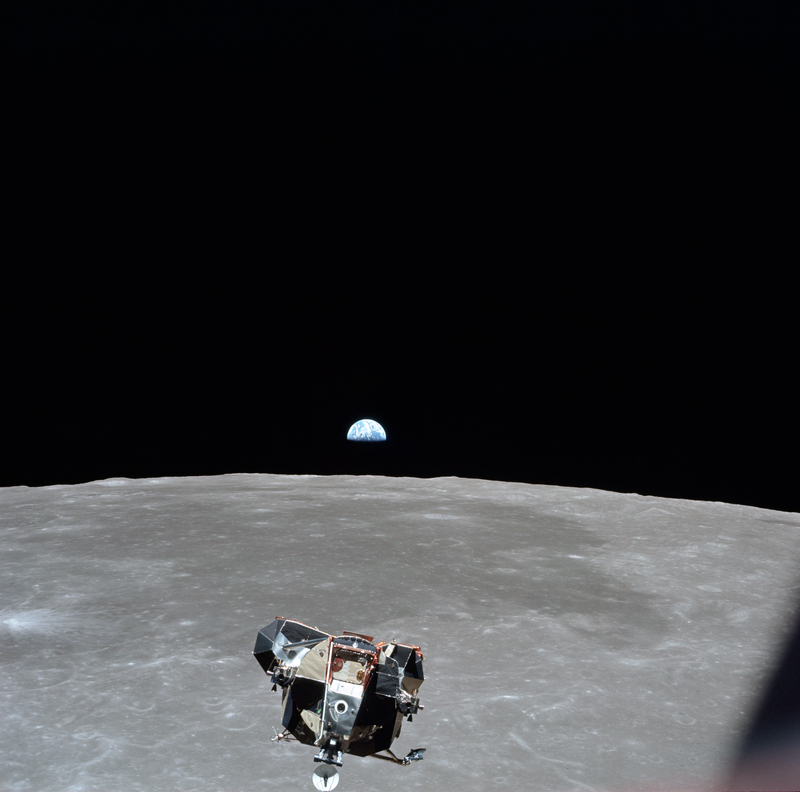 125:34:15 Aldrin (onboard): Yes, that perigee we're on [garble]. 125:34:20 Armstrong (onboard): [Garble] alright, isn't it? 125:34:31 Aldrin (onboard): I got 4 feet forward and I got back 7 [garble]. 125:34:38 Armstrong (onboard): Boy, this water separator sure isn't working worth a durn. Maybe we ought to try the other one - [garble] water. Oh boy, this thing is just really spitting it. Two water separators (one for redundancy) are used to extract excess moisture from the breathing oxygen after it has been cooled. These use spinning blades to throw condensed water off into a drum where it is collected and fed to a tank. 125:34:53 Aldrin (onboard): I sure do. It's been on - yes, we do - it's been on all the time. 125:35:06 Armstrong (onboard): We should see the tracking light now. That's it. Doesn't look [garble] but it's not - turned off. 125:35:16 Aldrin (onboard): Okay, let's try and get a Y-dot, or an R-dot, at 30 seconds. 125:35:21 Armstrong (onboard): It'll be the first time we've ever done it. 125:35:30 Aldrin (onboard): No, let me get comm. 125:35:48 Aldrin (onboard): We're really going to be crying. 125:35:54 Armstrong (onboard): My - top thruster over here has got a lot of brown holes in it - in the exit nozzle. 125:36:05 Armstrong (onboard): See it? 125:36:13 Aldrin (onboard): You know, these thrusters aren't used much over here. Well, maybe [garble] or something. 125:36:31 Armstrong (onboard): See it? 125:36:46 Aldrin (onboard): When we get the Sun behind us, we might be able to. 125:37:04 Aldrin (onboard): Hey, I got to recycle. Then after [garble]. 125:37:28 Aldrin (onboard): It's all over me. 125:37:38 Aldrin (onboard): Coming out of that vent back of my neck, isn't it? That where it's coming out? This is related to the ineffective water separator and it is mentioned later at 126:13:01. 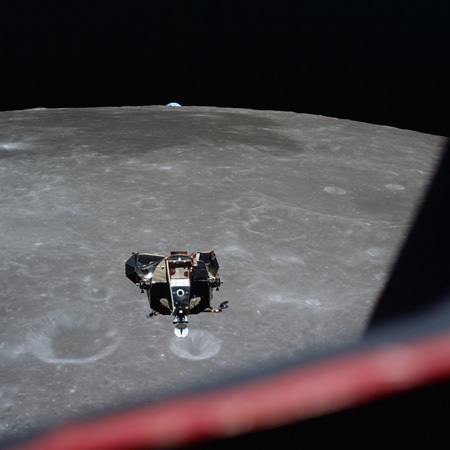 125:38:44 Aldrin (onboard): Give us the CSI state vector - navigation difference - no updating CSI [garble]. 125:39:02 Aldrin (onboard): Through AGS. 125:39:45 Aldrin (onboard): Thinking about it. 125:39:51 Armstrong (onboard): You going to come up with a solution for us? 125:40:33 Armstrong (onboard): Range rate? 125:40:35 Aldrin (onboard): Range rate. 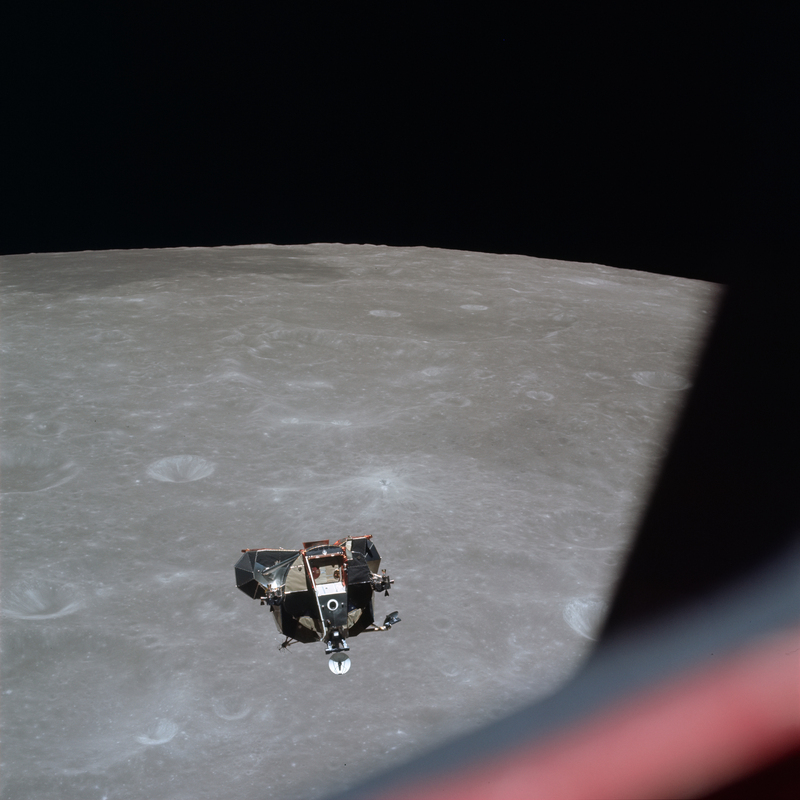 125:40:45 Aldrin (onboard): A lot of trouble having our [garble] up. 125:41:08 Aldrin (onboard): Range/range rate is [garble]. 125:41:23 Aldrin (onboard): Yaw, damn it! 125:42:28 Collins (onboard): [Garble] is up. This is the expected ignition time for their next engine burn, the CDH burn. 125:43:17 Aldrin (onboard): [Garble] feet per second. 125:43:19 Armstrong (onboard): Both tanks were pressurized, weren't they? 125:43:22 Armstrong (onboard): Sure shook them up. I remember that Gene said theirs didn't drop a bit - remember that - when they pressurized? Don't think theirs dropped at all. Armstrong is referring to Gene Cernan's Lunar Module Snoopy, on Apollo 10. 125:44:43 Armstrong (onboard): We're getting minus 2.9. 125:44:48 Aldrin (onboard): Going AGS all the way, huh? 125:44:50 Armstrong (onboard): Yes, forget it. 125:44:54 Aldrin (onboard): Get more tracking if we forget. 125:45:01 Armstrong (onboard): No, we'll just - we'll just wait until CDH. 125:46:19 Armstrong (onboard): You got a lot of film left in there? 125:46:23 Aldrin (onboard): About half. 125:46:26 Armstrong (onboard): You could run it some here. Oh, you just - you want to leave some for docking, huh? 125:46:50 Armstrong (onboard): [Garble.] Got that cockpit all cleaned up so that we got places for all our trash, Mike? 125:47:21 Armstrong (onboard): Yes, we got them all over us - look like chimney sweeps. 125:47:36 Armstrong (onboard): You bet you. Nice to get home. 125:48:22 Aldrin (onboard): Got that? 125:48:24 Armstrong (onboard): What do you need? 125:48:44 Armstrong (onboard): It's not over here. Well, that's a good day not to throw in some failures. See if we can run the nominal one time. This is Apollo Control. 125 hours, 52 minutes Ground Elapsed Time. Less than a minute away from the acquisition of the spacecraft Columbia coming around on the near-side of the Moon on the twenty-sixth revolution. Some 3 minutes, 11 seconds away from Eagle's appearance on the lunar front side. Stand by here for word that we have acquired data and voice link. Spacecraft Communicator Ron Evans is standing by for AOS so that he can pass some information to the crew of the two spacecraft. We have AOS of the spacecraft, Columbia. 125:53:12 Armstrong (onboard): I don't think so, Mike, we got to - [garble]. 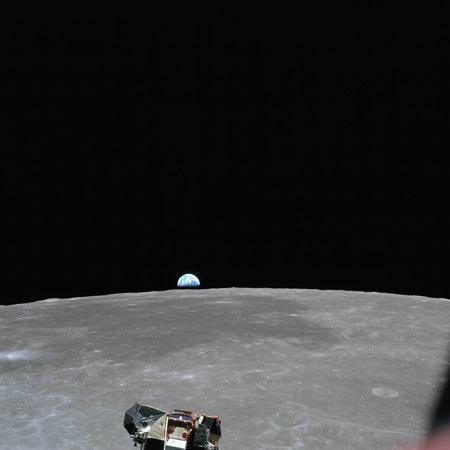 125:53:24 Aldrin (onboard): [Garble] want to go to that - [garble]. 125:53:26 Collins (onboard): Stand by for [garble]. 125:53:32 Armstrong (onboard): Right, that's what we've got. 125:56:11 Collins: [Very weak.] Houston, Columbia. Over. 125:56:15 Evans: Columbia, Houston. You're very weak. Say again. 125:56:26 Collins: [Very weak.] Roger. Houston, Columbia. CSI nominal; no plane change. Everything's going beautifully, and the LM seems to be seeing your laser [garble]. 125:58:24 Aldrin: Houston, this is Eagle. Over. 125:58:27 Evans: Hey, Eagle, Houston. Loud and clear. Columbia was very weak. We were unable to read him. 125:58:36 Aldrin: Roger. We saw you come up over the horizon and it looks like you had a laser operating. Could you confirm that? Aldrin means the Earth rising over the horizon, and he is asking whether a laser was being fired at the Moon as part of an experiment also undertaken earlier in the mission. Lasers will also be used to target the reflector they had left on lunar surface the previous day. 125:59:24 Aldrin: Okay. The CSI burn was on scheduled time of 125:19:34.70, 51.5 feet per second was our solution. After chasing residuals a little bit, we ended up with a minus 0.2, plus 0.7, and minus 0.1. And in the AGS, at that time, we had plus 0.4, plus 0.9, and plus 0.3. 125:59:57 Evans: Eagle - Eagle, Houston. We copy. Any plane change? Over. 126:00:04 Aldrin: No. There was no plane change on CSI, and CSM had a 2.3 foot per second burn. We had a 2.9, and we elected to postpone that. Over. Eagle could have adjusted for the two orbits being slightly out of plane when it made the CSI burn but the major opportunity for plane change correction would have occurred about 30 minutes later when the planes of the orbits cross. The crew's measurements found that the planes of the orbits were close enough not to have to make any correction. 126:00:41 Collins: [Very weak.] Eagle, how about asking them for some High Gain angles for me, will you, please? 126:00:46 Aldrin: Roger, Houston, do you have some High Gain angles for Columbia? Over. 126:01:15 Evans: Eagle, Houston. Could you verify you switched lithium hydroxide canisters? Over. 126:01:24 Aldrin: That's affirmative. We started getting an erratic indication on primary, so we switched to secondary, and it was again erratic, and I thought it might have been a sensor. But it's settled down now, and we're on the secondary. Over. 126:01:47 Evans: Columbia and Eagle. Request Omni Delta for Columbia. 126:02:09 Armstrong: Houston. Columbia's been on Delta, but he hasn't had much luck with you. 126:02:18 Evans: Eagle, Houston. Roger. We copy. 126:03:20 Collins: [Very weak.] Eagle, are you ready to copy [garble]. This is Apollo Control. Columbia's now in an orbit measuring 56.6 nautical miles [104.8 km] by 62.5 nautical miles [115.8 km], and the displays here in Mission Control show the range from Eagle to Columbia a tad over 100 nautical miles [185 km] and about 99 feet per second [30.2 m/s] closure rate. 126:05:04 Evans: Columbia, Houston. Over. 126:05:31 Collins: [Very weak.] Eagle, Tell them [garble] loud and clear since AOS [garble]. 126:05:39 Armstrong: Houston, Eagle. Columbia's been reading you loud and clear on his Omnis, but he hasn't had any luck at transmitting to you. 126:05:50 Evans: Roger, Eagle. Mighty fine. We don't hear Columbia though. 126:07:27 Collins: [Very weak.] [Garble] burning [garble] at this point? 126:08:32 Evans: Eagle, Houston. At your convenience [garble]. 126:08:40 Evans: Columbia, Houston. At your convenience you can go to Reacq [garble] on the High Gain [garble]. 126:09:42 Evans: Columbia, Houston. Over. 126:09:59 Evans: Columbia, Houston. You can go ahead and go to Reacq in the High Gain. We should get you then. 126:10:16 Aldrin: Do you have some angles for him, Houston? 126:10:18 Evans: Roger. Pitch minus 30, yaw 180, for Columbia. 126:10:29 Collins: [Very weak.] Copy. Thank you. 126:10:30 Aldrin: Okay. And what was your CSI - CDH solution, Mike? 126:10:35 Collins: [Very weak.] [Garble] 44 [garble] .6. Correction [garble] .4 and 14.6. Over. 126:11:31 Armstrong: And, Houston, Eagle. Got an ECS light and a CO2 light. Partial pressure's reading about one-half millimeter. 126:12:03 Collins: Houston, how do you read Columbia now? 126:12:22 Evans: Eagle, Houston. We're sure that's a sensor problem. You can leave it on Primary. 126:12:41 Armstrong: Roger. We pulled the circuit breaker. 126:13:47 Collins: Eagle, Columbia. Standing by to back you up on the burn. Just let me know how it's going. This is the CDH or Constant Delta Height burn which will shape Eagle's orbit to match Columbia's but be 15 nautical miles (28 km) closer to the Moon. It is due in less than 4 minutes. 126:13:58 Aldrin: Okay. You want to know what our Noun 81 is? Noun 81 gives the three Delta-V components expected of the burn. 126:14:03 Collins: Ready to copy. 126:14:05 Aldrin: Okay. I think you already got the burn time - minus 8.1 [fps, -2.5 m/s], minus 1.8 [-0.5], minus 18.2 [-5.5]. 126:14:19 Collins: Okay. That's pretty close agreement. And, for burn time, I still have 126:17:46. 126:15:06 Evans: Eagle, Houston. For a warm feeling, we're - we are agreeing with your CDH. The two spacecraft are being tracked from Earth, allowing Mission Control to come up with their own solution for the CDH burn. The fact that their solution matches that from Eagle's radar and computer gives reassurance that the rendezvous is going well. 126:15:28 Aldrin: Unfortunately, the chart doesn't agree with it, because the range-rate at 36 minutes was off the chart. Apollo Control here. Less than a minute remaining until the Constant Delta Height or CDH maneuver. We'll continue to monitor the air-ground. This a small magnitude radial burn to put Eagle in a orbit that's concentric with - Here we go. Thirty seconds. 126:17:31 Collins: Yeah. I'm ready. Okay. The CDH burn begins at 126:17:50. This is Apollo Control. Range now showing 91.3 nautical miles [169.1 km]. Range-rate, rate of closure, 119 feet per second [36 m/s]. 126:20:37 Collins: Eagle, Columbia. Passing over the Landing Site. It sure is great to look down there and not see you. 126:21:09 Evans: Roger. Did you copy on the LCG, there, and the reading on the water accumulator? 126:21:15 Armstrong: Yeah. Roger. I did. I'm getting [garble]. 126:22:20 Aldrin: Houston, the water accumulator is right on the line between the red and the green. Over. 126:22:26 Evans: Eagle, Houston. Roger. We copy. 126:24:20 Evans: Roger. On the water problem there, we can't add anything more to it, except the fact that it looks like the water accumulators are up to speed, to us down here. 126:24:35 Armstrong: Okay. It's not going to be too much trouble. 126:24:40 Aldrin: It's just in one suit, too, for some reason. 126:26:29 Evans: Columbia, Houston. Our comm problem was traced to a ground station here. 126:26:38 Collins: Okay. Glad to hear it. 126:26:39 Evans: Roger. You're mighty fine now. This is Apollo Control. Range between Eagle and Columbia now showing 67.5 nautical miles [125.0 km]. Range-rate, closure rate, 121 feet per second [37 m/s]. 126:32:43 Collins: I have a TPI TIG when you guys want to compare them. Eagle has carried out two of the burns required for this coelliptical rendezvous, CSI and CDH (and have elected not to do a plane-change burn). There is one major burn left, the Terminal Phase Initiation or TPI burn which will set Eagle on a near-intercept path towards Columbia. Using the VHF ranging system, Mike can make his own calculation of when the TPI burn should occur. 126:33:15 Aldrin: Go ahead, Mike. What have you got? 126:33:25 Aldrin: You're about 32 seconds later than we are. This implies that the LM solution is 127:02:02. In the event, the burn will be made at 127:03:52 as continued tracking refines the LM solution but as it stands, Mike is nearer the mark. This is Apollo Control. Some 25 minutes now until the TPI, Terminal Phase Initiation burn, just before Loss Of Signal as both spacecraft go over the hill. This is Apollo Control. The Black Team of flight controllers here in Mission Control are more or less in an advisory capacity during this rendezvous sequence. They're actively computing maneuver times, but in the final analysis, it's onboard computations by the crew of Columbia and Eagle which really bring about the rendezvous. Standing by at 126 hours, 37 minutes Ground Elapsed Time; some 24 minutes away from ignition on the thrust along the line of sight for Terminal Phase Initiate. 126:42:56 Aldrin: Range rate at 40. 126:44:16 Collins: Buzz, I'd like to confirm that your TPI TIG is 127:02:02. Over. 126:45:12 Collins: Just as soon as you know what TPI TIG's going to be, I'd appreciate a call. 126:45:40 Collins: Thank you. Are you going to be revising that one? 126:45:56 Collins: Well, to stay on my time line, I should have it in the next couple of minutes. 126:48:07 Aldrin: Okay. Latest estimate, 127:03:39. 126:48:45 Aldrin: Roger. Go ahead. 126:48:47 Evans: Roger. In the event of the possibility that we may have had some water channeling in those hydroxide canisters, we recommend you stay in the cabin mode from now on. Over. 126:51:32 Evans: Roger. I'd better clarify that cabin mode a little bit there. What we mean is you go ahead and stay in the cabin mode. Helmets and gloves on are your option. And we really have no concern with the CO2. Over. 126:52:51 Aldrin: Mike, you already loaded that time? We've got a final one here. 126:52:58 Collins: I've already loaded it. I don't think it'll make much difference. 126:53:01 Aldrin: Roger. Only 9 seconds difference. Mox nix is attributed to the German idiom, macht nichts, meaning 'it doesn't matter'. 126:54:12 Collins: Columbia. Go ahead. 126:54:13 Evans: Roger, Mike. You can go ahead and arm your logic anytime you want to, and we'll give you a Go so that you can get your Pyro Arm at your convenience. 126:54:23 Collins: That's a good idea, babe. You standing by to watch the logic? 126:54:26 Evans: Affirmative. Give us a Mark. 126:54:30 Collins: Mark, Logic 1. 126:54:59 Evans: Columbia, Houston. We need the SECS Arm circuit breakers closed. 126:55:27 Evans: Columbia, Houston. Logic looks good. You can arm your Pyros at your convenience. 126:55:55 Collins: Eagle, Columbia's starting to maneuver to TPI attitude. This is Apollo Control; about 6½ minutes to ignition on the Terminal Phase Maneuver in which the crew of Eagle will thrust along the line of sight toward Columbia. Distance now between the two spacecraft, some 38.6 nautical miles [71.5 km], closing at a rate of 110 feet per second [34 m/s]. 126:58:18 Aldrin: And, Mike, if you want our target Delta-V, I'll give it to you. 126:58:22 Collins: Ready to copy. 126:58:23 Aldrin: 127:03:30.82, twenty - plus 22.7, plus 1.7, minus 10.6. Over. 126:58:41 Collins: 127:03:30.82, plus 22.7, plus 1.7, minus 10.6. Thank you. The LM's current solution for TPI ignition time is 127:03:30.82. The expected Delta-V in fps (m/s) is X, +22.7 [+6.9]; Y, +1.7 [+0.5]; Z, -10.6 [-3.2]. 127:00:55 Armstrong: I'm showing a good bit of out-of-plane velocity on my cross-pointers, Mike. 127:01:03 Collins: Rog. I have no indication of it. 127:02:32 Collins: Coming up on 1 minute to TIG, Neil. How's it looking? 127:02:43 Armstrong: That out-of-plane was in the AGS, not in the radar. The AGS is inherently less accurate than the primary guidance system. 127:03:47 Armstrong (onboard): Ready to burn? 127:04:32 Armstrong (onboard): Okay, that's it. 127:04:42 Collins: Roger. Thank you. 127:04:43 Evans: Eagle, Houston. Aft Omni, low-bit rate, and we'll see you at 127 plus 51. Eagle has been injected into a new elliptical orbit which, over the coming 130° of travel around the Moon, will take it to a point just above Columbia. 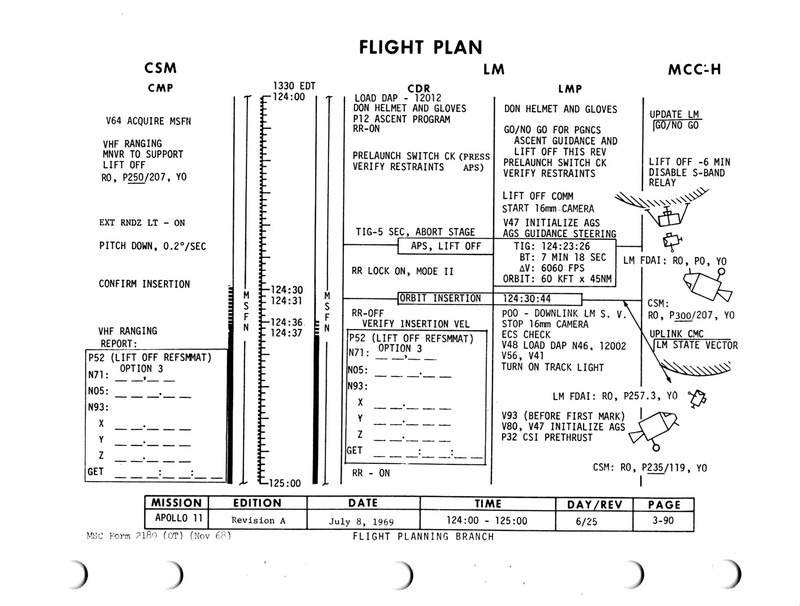 The approach has been arranged so that, with respect to the stars, Eagle is following a straight line towards Columbia and therefore the CSM ought to appear static with respect to the background star pattern. This makes it easy for Neil and Buzz to see if their approach is true and compensate for any drift off that straight line. A course correction manoeuvre is planned for the approach every 15 minutes or so. Then as they near Columbia, they will execute a braking manoeuvre the Terminal Phase Final or TPF burn. This is Apollo Control. We've apparently had Loss Of Signal with Columbia and Eagle as they went behind the Moon on the 26th revolution. Next maneuver scheduled for about 33 minutes from now. While both vehicles are behind the Moon, this will be the braking series of maneuvers coming down to docking, or station-keeping first, and then docking at about 128 hours Ground Elapsed Time. And at 127 hours, 6 minutes Ground Elapsed Time in the flight of Apollo 11; this is Mission Control. 127:05:07 Aldrin (onboard): Okay, [garble] 5, huh? 127:06:10 Armstrong (onboard): Well - say when [garble] Oh, wait a minute. 127:06:55 Armstrong (onboard): Pretty reasonable. 127:06:59 Aldrin (onboard): AGS had these residuals after its completion after the burn. 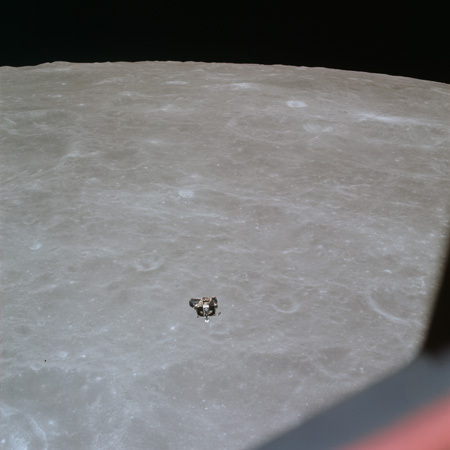 127:07:39 Armstrong (onboard): I can't see you, Michael. 127:07:44 Collins (onboard): [Garble] moving in at [garble]. 127:07:50 Armstrong (onboard): Okay. I got good radar. I just can't see you. 127:08:49 Aldrin (onboard): Do you think that pressure dropped? 127:08:54 Aldrin (onboard): It doesn't show up in the [garble] books. I don't see any reason why we don't take them all back. All that we've got [garble]. 127:09:00 Armstrong (onboard): All got data. 127:09:02 Aldrin (onboard): We all got something [garble]. 127:10:20 Aldrin (onboard): Okay, you try getting it - [garble]? 127:10:25 Armstrong (onboard): No, I haven't been. Do you want me to? 127:10:27 Aldrin (onboard): No, I got to keep the chart. 127:10:58 Armstrong (onboard): [Garble] can take this update for them. 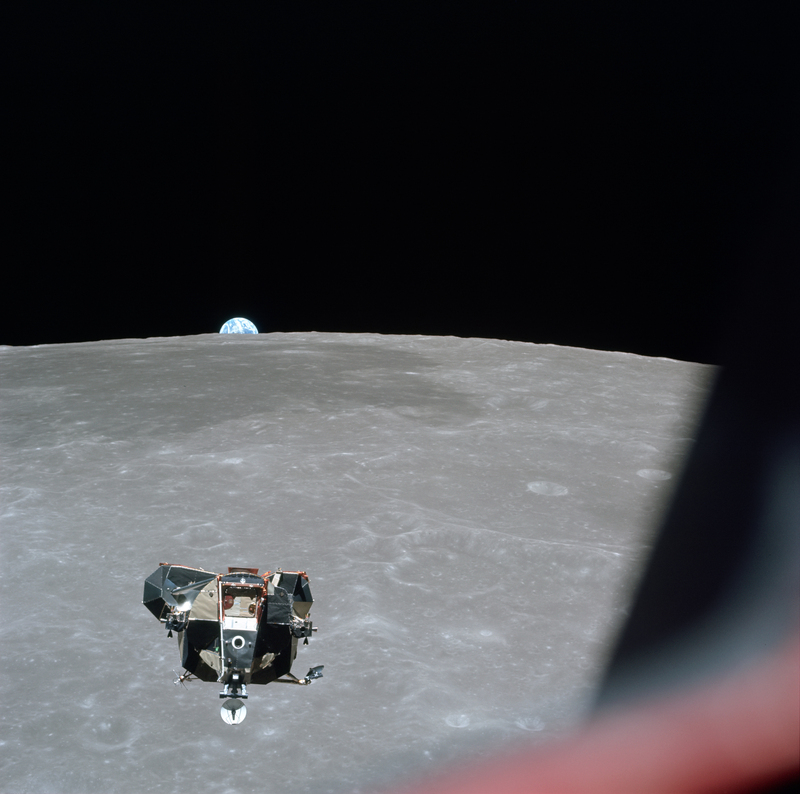 127:12:00 Aldrin (onboard): On the track about, huh? 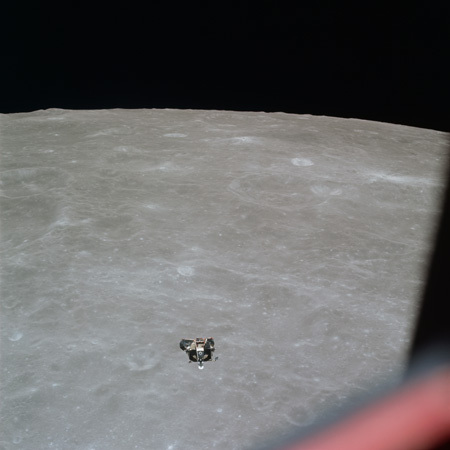 127:12:21 Aldrin (onboard): Boy, my shoulders sure hurt. 127:12:23 Armstrong (onboard): Mine are, too. 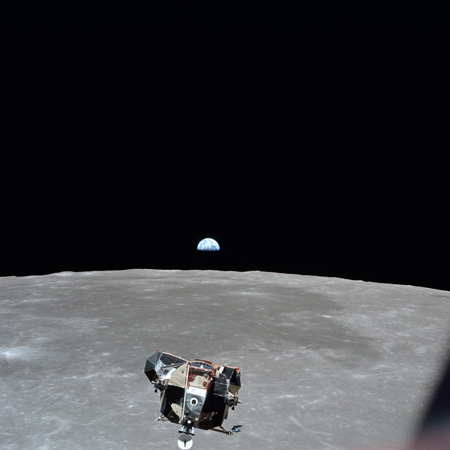 127:12:26 Aldrin (onboard): Last night I couldn't get this far from the [garble]. 127:12:30 Armstrong (onboard): I was the same way. 127:13:00 Aldrin (onboard): Use all the green tape, did you? 127:14:31 Armstrong (onboard): I got it in sight now, Mike. 127:16:18 Aldrin (onboard): Yes, so do we. 127:16:19 Armstrong (onboard): A hundred and what? 127:16:37 Aldrin (onboard): Okay, Noun 81, minus 0, plus 0.4, plus 0.9. 127:17:53 Aldrin (onboard): [Garble] your burn's a little late. 127:18:04 Armstrong (onboard): [Garble] be burning - [garble]. 127:18:12 Aldrin (onboard): Okay, [garble] the [garble] on? There it is. 127:18:28 Aldrin (onboard): Neil, I guarantee you that the burn is precise, okay? Neil carries out a midcourse correction burn at 127:18:31 as they continue to approach Mike. According to the Apollo 11 Mission Report, the Delta-V from the burn is zero forward, 0.4 fps [0.12 m/s] right and 0.9 fps [0.27 m/s] down. Collins, from 1969 Technical debrief: "It looked like the doggone LM was riding on rails. There was absolutely no line-of-sight rate that I could see. It really looked great to see the LM coming up from the surface. For the first time, I had the feeling that that son of a gun was really going to get there in one piece." 127:18:39 Collins (onboard): [Garble] good burn [garble]. 127:18:43 Armstrong (onboard): No, it's not going to be late. Maybe 5 seconds. 127:19:17 Armstrong (onboard): Burn complete. 127:19:19 Collins (onboard): Thank you. 127:20:13 Armstrong (onboard): Well, it's all over but the docking. 127:20:26 Armstrong (onboard): Check the start out there. 127:20:51 Aldrin (onboard): You still got him? 127:20:55 Armstrong (onboard): Yes. I probably won't when the sun gets in my telescope. 127:21:06 Aldrin (onboard): [Garble.] [Garble] hold the [garble]. 127:21:13 Armstrong (onboard): The what? 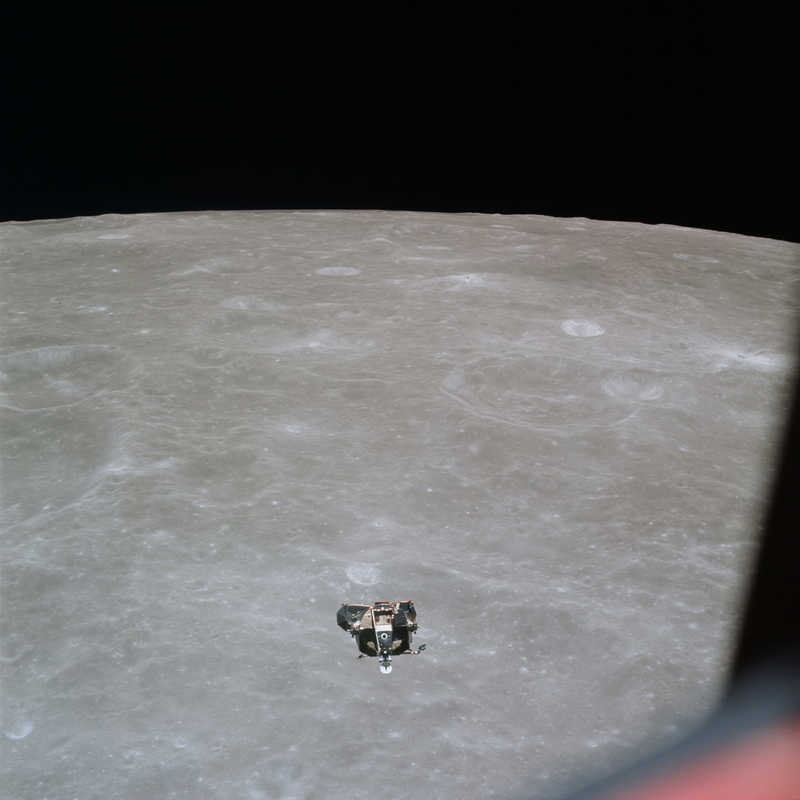 127:21:14 Aldrin (onboard): Won't hold the [garble]. 127:21:19 Collins (onboard): [Garble] going right down the [garble] and it sure has been nice. 127:21:23 Armstrong (onboard): Okay. I just got sight of you in the sunlight here. 127:21:29 Aldrin (onboard): Oh, I've got him. 127:21:51 Armstrong (onboard): I've got him now, too. 127:22:00 Aldrin (onboard): Sure enough. 127:22:11 Collins (onboard): Well, I see you don't have any landing gear. 127:22:15 Armstrong (onboard): That's good. 127:22:27 Armstrong (onboard): You're not confused on which end to dock with, are you? 127:22:58 Armstrong (onboard): Okay, Mike, if there's some data bags around there - I may have one or two in my temporary stowage - why, we may want them in addition to the other regular bags, so we can put some of this data back in it. 127:23:13 Collins (onboard): In the data bags? 127:23:16 Armstrong (onboard): Yes, there are a couple of different LM bags that I left in there. 127:23:21 Collins (onboard): Okay, well, why don't we [garble] back over there and [garble]? 127:23:39 Collins (onboard): [Garble] bring the bag [garble]. 127:23:45 Armstrong (onboard): Could be. 127:24:13 Collins (onboard): Okay, [garble] have a plastic one and a [garble]. 127:24:23 Collins (onboard): Bring the [garble] back. 127:24:40 Armstrong (onboard): I think we'll make it [Laughter]. 127:24:44 Aldrin (onboard): Don't tell that to poor [garble], though (laughter). 127:24:56 Armstrong (onboard): We'll see you at [garble]. 127:25:31 Armstrong (onboard): One of those two bright spots is bound to be Mike. 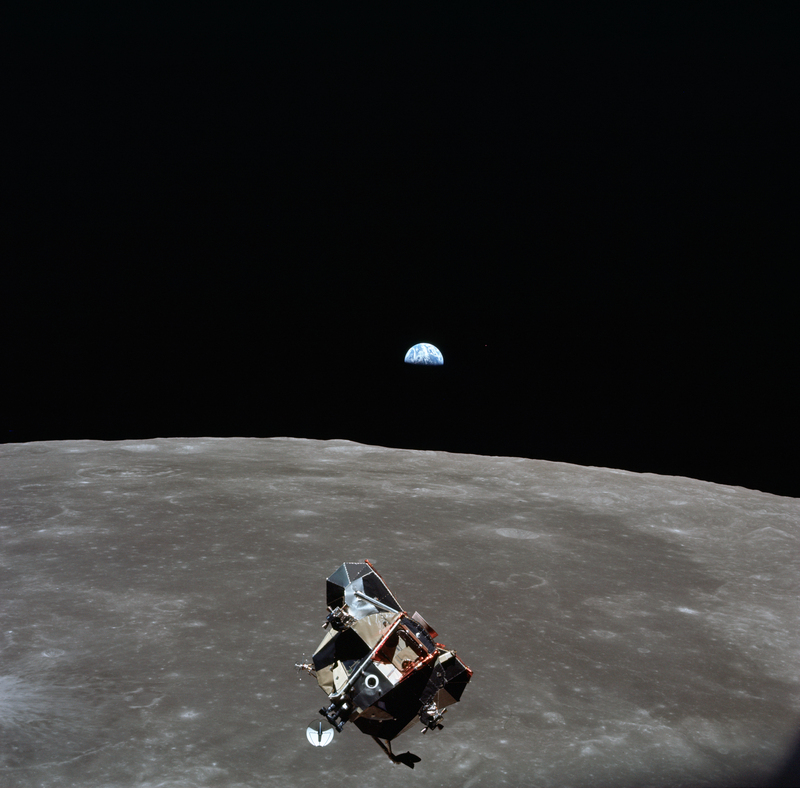 127:25:36 Aldrin (onboard): How about picking the closest one? 127:25:44 Armstrong (onboard): Good idea. 127:26:17 Aldrin (onboard): [Garble] this light? 127:26:21 Armstrong (onboard): Is that alright? 127:27:16 Armstrong (onboard): Right - that's [garble]. 127:27:26 Aldrin (onboard): 12 on here, right? 127:27:29 Armstrong (onboard): Not exactly. 127:27:30 Aldrin (onboard): Not exactly? 127:27:32 Armstrong (onboard): You're a little less. You're 10 seconds less in [garble]. About that [garble]. 127:28:23 Armstrong (onboard): Look's like you're making a high [garble] on us, Michael. 127:28:27 Collins (onboard): Yes, [garble]. 127:29:26 Collins (onboard): [Garble] let me move in just a [garble]. 127:29:31 Armstrong (onboard): No, we aren't that - confident. 127:30:12 Aldrin (onboard): We've got about 54. 127:30:47 Armstrong (onboard): You got [garble] to [garble]? 127:30:50 Armstrong (onboard): The [garble]? 127:30:51 Aldrin (onboard): Yes. [Garble]. 127:31:05 Armstrong (onboard): Let's try this midcourse out. 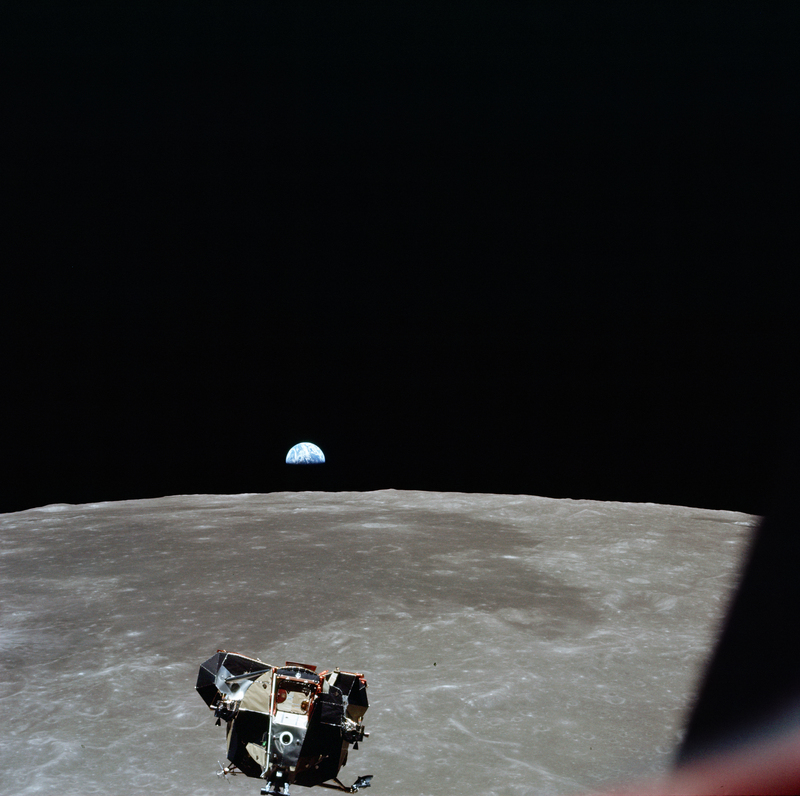 127:31:08 Aldrin (onboard): Right. Okay, it's [garble]. 127:31:40 Armstrong (onboard): Is that right, I hope? 127:31:59 Armstrong (onboard): It should be 70. 127:32:25 Aldrin (onboard): Okay, I can see the shape of your vehicle now, Mike. 127:32:42 Armstrong (onboard): Oh, yes - got your High Gain in sight, your tracking light - whole vehicle shows. I see that you're pointed at me. Now, you're turning a little bit - great. Neil burns a second midcourse correction burn at 127:33:31. According to the Apollo 11 Mission Report, the Delta-V from the burn is 0.1 fps [0.03 m/s] forward, 1.2 fps [0.37 m/s] right and 0.5 fps [0.15 m/s] down. 127:33:49 Collins (onboard): Are you burning yet? 127:33:50 Armstrong (onboard): We're burning. 127:34:15 Aldrin (onboard): Good enough. 127:34:21 Armstrong (onboard): Seems like when you get down to around 110, you just keep chasing him. You put it in - stick it in one axis, and it goes through - out of another, especially when [garble] stays about the same. 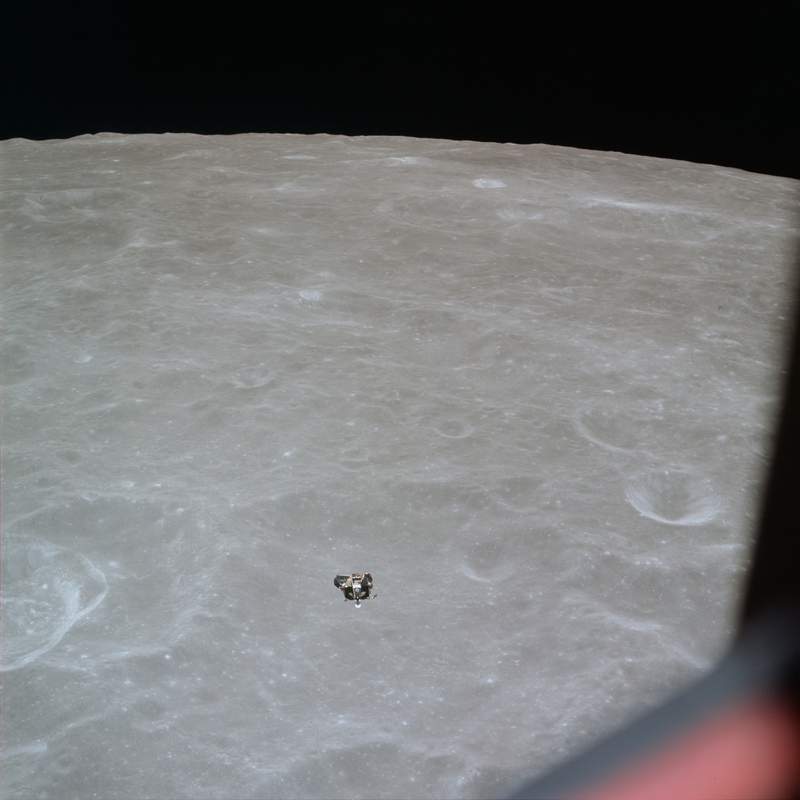 127:34:30 Aldrin (onboard): If it's [garble], it's definite. 127:34:43 Aldrin (onboard): Okay, now, let's see. We want to change the DAP - that what we want to do? 127:34:49 Collins (onboard): I need a P76 now, Buzz. 127:34:54 Aldrin (onboard): Okay, you got the time for the burn. Noun 81 was plus 0.1, plus 1.2, plus 0.5. 127:35:23 Aldrin (onboard): [Garble] plus [garble]. 127:36:14 Armstrong (onboard): 8.2 miles [15.2 km], 40 feet per second [12.2 m/s]. 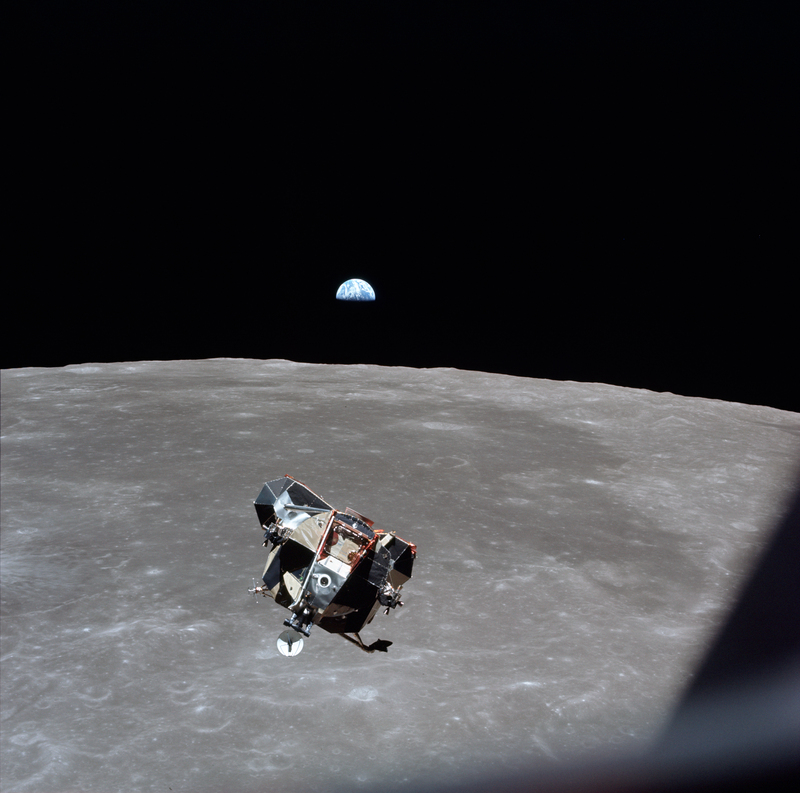 127:36:26 Aldrin (onboard): You can have your place now. The initial approach trajectory was deliberately given an apolune that was higher than the CSM's altitude. Had the LM's apolune matched the CSM's altitude, then the intercept would have required a full half-orbit or 180° of revolution rather than the desired 130°. The 130° intercept means that without intervention, Eagle would sail past Columbia so at 127:36:57, Neil begins a sequence of braking manoeuvres as laid out in the Flight Plan to slow his approach to where he can station-keep to the CSM. 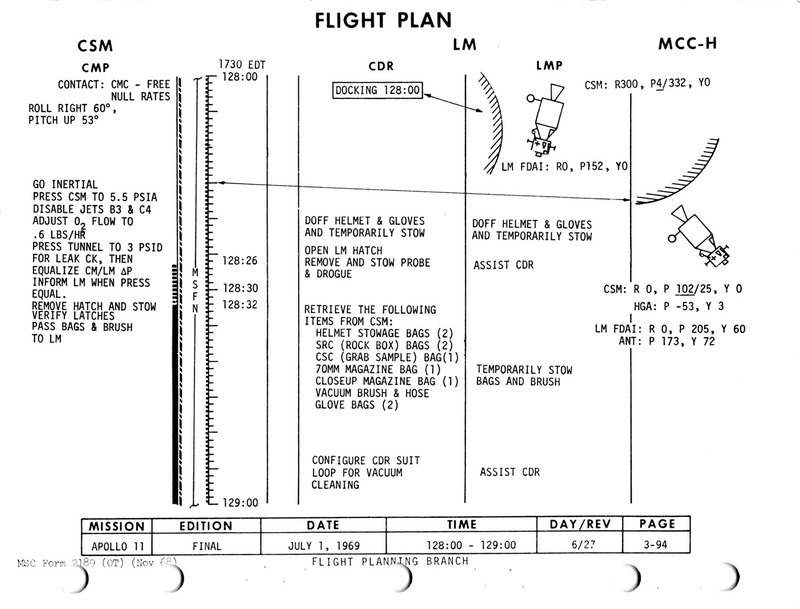 Braking burns table from page 3-93 of the Flight Plan. A typo is noted in this table in that the time from TPI given for the first manoeuvre should be 38:49, not 28:49. 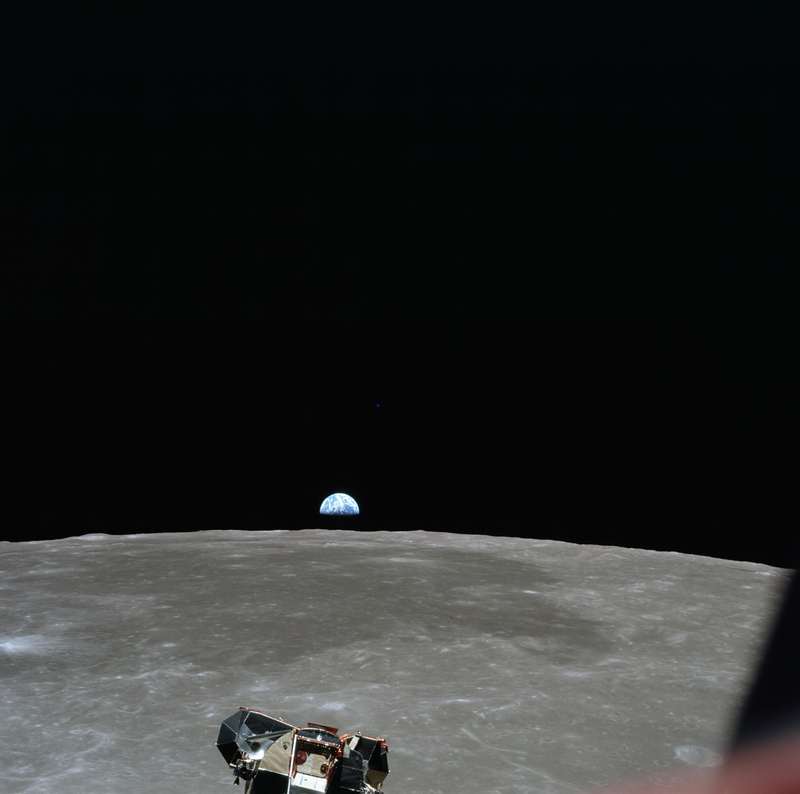 127:37:01 Aldrin (onboard): Can you see our tracking light, now? 127:37:04 Collins (onboard): [Garble] but you're in between my sextant and my COAS. 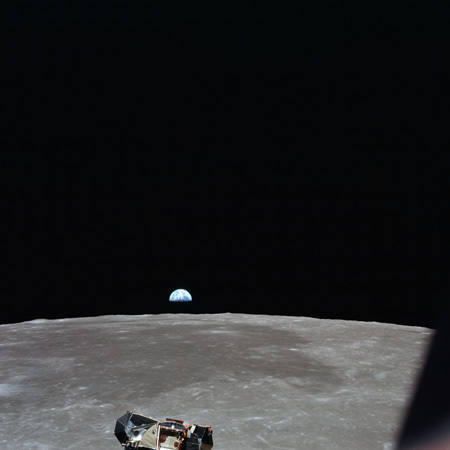 127:38:33 Aldrin (onboard): Where'd you put the [garble]? 127:38:35 Armstrong (onboard): My what? 127:38:36 Aldrin (onboard): Your [garble] for [garble]. 127:38:39 Armstrong (onboard): It's in the bottom over [garble]. 127:39:30 Collins (onboard): [Garble] pick me up [garble]. 127:39:33 Armstrong (onboard): I got you. 127:39:34 Collins (onboard): Okay. Don't [garble] other spacecraft. 127:39:40 Aldrin (onboard): No, I'm not going to lose you, brother. 127:39:49 Collins (onboard): What have you got for [garble]? [Garble] I have 6.8 and 9 miles, [garble] out. Oh, that checks. 127:40:06 Armstrong (onboard): Got [garble] up? I thought I made it pretty clear. 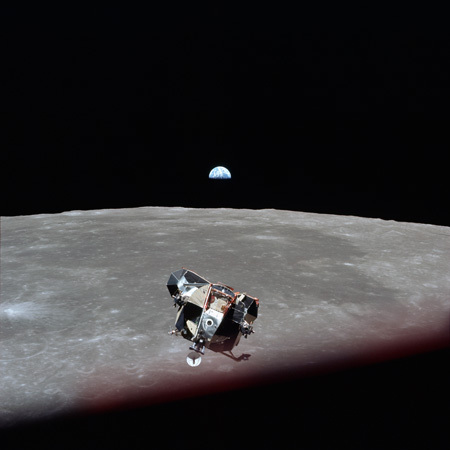 127:40:20 Aldrin (onboard): Not as sporty a [garble] as we thought, huh? 127:40:25 Armstrong (onboard): That wasn't - bad at all. The alignment was - pretty dicey. 127:40:31 Aldrin (onboard): Yes, sir. 127:40:34 Armstrong (onboard): That was just luck [Laughter]. 127:40:39 Aldrin (onboard): I hope you [garble]. 127:40:49 Aldrin (onboard): I'll be glad to get to the [garble]. 127:40:52 Armstrong (onboard): Yes, but I hate to [garble]; will you get [garble]? 127:41:02 Armstrong (onboard): Oh, it'll come off, I guess - [garble]. 127:41:10 Aldrin (onboard): ...these screws here might do it. 127:41:13 Armstrong (onboard): ...there's a couple of bolts down there that have come loose - if I remember. [Garble] I'll get them. 127:41:21 Collins (onboard): I'm slowly closing at 32 feet per second [10 m/s] and a mile-and-a-half [2.8 km]. 127:41:25 Armstrong (onboard): Okay, I've got a mile-and-a-half and 32½. 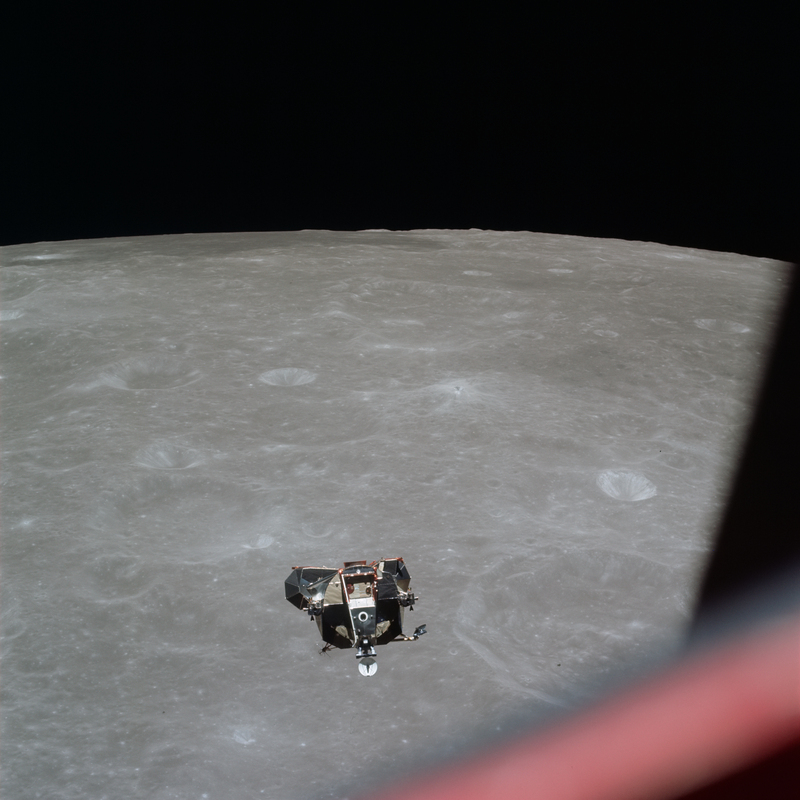 127:41:40 Aldrin (onboard): Take [garble]. 127:41:43 Armstrong (onboard): Yes, I guess it'll take us another - 6 minutes or something like that. 127:41:48 Collins (onboard): [Garble] we got 15 [garble]. 127:42:23 Aldrin (onboard): That's going to hit the braking gate right on the schedule. 127:43:02 Armstrong (onboard): Okay, let's put P47 in. P47 is a thrust monitor program. It will let Neil watch the effect of the braking manoeuvres he is about to make. It also includes Nouns that will show range and range rate as well as the size of their orbit. 127:43:22 Armstrong (onboard): I don't know why I lost my - I'm at - oh, did you - you lost your transponder, Mike - I think. 127:43:33 Collins (onboard): [Garble] pitch up a bit. 127:43:36 Armstrong (onboard): I wish you would. 127:43:43 Collins (onboard): I have 0.7 mile [1.3 km] and I got you at 31 feet per second [9.5 m/s], [garble] look good. 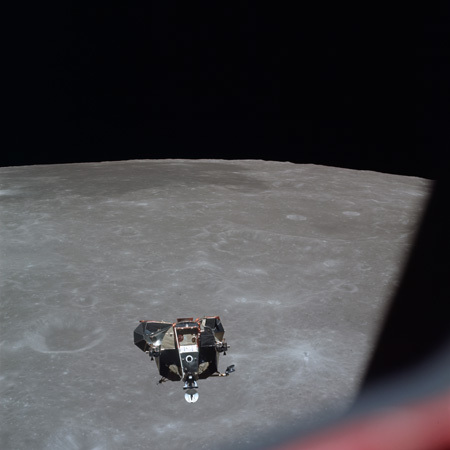 127:43:50 Aldrin (onboard): Okay, [garble]. About now, Mike begins to film the approaching ascent stage as they orbit above the Moon. At the start of the shot, the LM is almost impossible to see except for a flashing light lower left of centre. 127:43:57 Aldrin (onboard): Okay, we're getting it. 127:44:12 Collins (onboard): Are you [garble] forward now? 127:44:15 Aldrin (onboard): Yes - yes, we're in good shape, Mike. We're braking. 127:44:53 Armstrong (onboard): Flying all over us. 127:46:13 Armstrong (onboard): Okay, we're about 11 feet a second [3.4 m/s] coming in at you. 127:46:43 Collins (onboard): That's good. What [garble] are you in? 127:47:05 Aldrin (onboard): Hope we're not going to get a pitch straight down. 127:47:59 Armstrong (onboard): Looks good. 127:49:06 Collins (onboard): I'm sure you're going to get [garble], I'll tell you that. 127:49:11 Armstrong (onboard): It flies good, though. 127:49:50 Armstrong (onboard): Okay, now, if I pitch over, I'm going to be looking right into the Sun. 127:50:09 Aldrin (onboard): Hope you know how to roll. 127:50:11 Collins (onboard): Yes, I do. I [garble]. As well as filming the approaching ascent stage, Mike begins taking a series of 23 photographs of the scene on a Hasselblad using magazine V (44). AS11-44-6621 - LM rendezvous. Crater Saha D on left, Al-Khwarizmi M is light-coloured crater on right. LM against Saha C. 80-mm lens. Image credit: Image Science and Analysis Laboratory, NASA-Johnson Space Center. AS11-44-6622 - LM rendezvous. Crater Saha D on left, Al-Khwarizmi M is light-coloured crater on right. LM against Saha C. 80-mm lens. Image credit: Image Science and Analysis Laboratory, NASA-Johnson Space Center. AS11-44-6623 - LM rendezvous. Crater Saha D on left. LM against western rim of Saha C. 80-mm lens. Image credit: Image Science and Analysis Laboratory, NASA-Johnson Space Center. AS11-44-6624 - LM rendezvous. Crater Saha C cut off in foreground. 80-mm lens. Image credit: Image Science and Analysis Laboratory, NASA-Johnson Space Center. AS11-44-6625 - LM rendezvous. Crater Saha B just beyond LM. 80-mm lens. Image credit: Image Science and Analysis Laboratory, NASA-Johnson Space Center. AS11-44-6626 - LM rendezvous. LM against crater Saha B. 80-mm lens. Image credit: Image Science and Analysis Laboratory, NASA-Johnson Space Center. AS11-44-6627 - LM rendezvous. Saenger P and Saenger Q beyond LM. 80-mm lens. Image credit: Image Science and Analysis Laboratory, NASA-Johnson Space Center. AS11-44-6628 - LM rendezvous. Saenger P right of LM. 80-mm lens. Image credit: Image Science and Analysis Laboratory, NASA-Johnson Space Center. AS11-44-6629 - LM rendezvous. LM between Wyld C and Saenger P. 80-mm lens. Image credit: Image Science and Analysis Laboratory, NASA-Johnson Space Center. AS11-44-6630 - LM rendezvous. Fox A beyond and left of LM. 80-mm lens. Image credit: Image Science and Analysis Laboratory, NASA-Johnson Space Center. AS11-44-6631 - LM rendezvous. LM appears next to crater Fox. 80-mm lens. Image credit: Image Science and Analysis Laboratory, NASA-Johnson Space Center. This is Apollo Control; 127 hours, 50 minutes Ground Elapsed Time. Less than a minute now away from acquisition of the spacecraft, Columbia. Hopefully flying within a few feet of it, will be Eagle. Docking should take place about 10 minutes from now, according to the Flight Plan. However, this is a crew option matter. We're standing by for word that data is coming in from the two spacecraft. 127:50:23 Aldrin (onboard): You want to end up with that window - opposite his right window so you don't want to roll right. Right? 127:50:34 Aldrin (onboard): The only trouble is, it's towards - towards 90, isn't it? 127:51:06 Aldrin (onboard): 90, huh? [Garble] 60? This is lunar revolution number 27 for Columbia. 127:51:29 Armstrong (onboard): I'll be looking into his left window when I pitch up. 127:51:36 Collins (onboard): [Garble] I got the Earth coming up already. It's fantastic! AS11-44-6632 - LM station-keeping and Earthrise. Crater Fox and Fox A visible below LM. 80-mm lens. Image credit: Image Science and Analysis Laboratory, NASA-Johnson Space Center. AS11-44-6633 - LM station-keeping and Earthrise. Babcock cut off by CM window frame. Mare Smythii beyond. 80-mm lens. Image credit: Image Science and Analysis Laboratory, NASA-Johnson Space Center. AS11-44-6634 - LM station-keeping and Earthrise. Babcock cut off by CM window frame. Mare Smythii beyond. 80-mm lens. Image credit: Image Science and Analysis Laboratory, NASA-Johnson Space Center. AS11-44-6635 - LM station-keeping and Earthrise. Babcock cut off by CM window frame. Mare Smythii beyond. 80-mm lens. Image credit: Image Science and Analysis Laboratory, NASA-Johnson Space Center. AS11-44-6636 - LM station-keeping and Earthrise. Babcock cut off by CM window frame. Mare Smythii beyond. 80-mm lens. Image credit: Image Science and Analysis Laboratory, NASA-Johnson Space Center. AS11-44-6637 - LM station-keeping and Earthrise. Babcock cut off by CM window frame. Mare Smythii beyond. 80-mm lens. Image credit: Image Science and Analysis Laboratory, NASA-Johnson Space Center. AS11-44-6638 - LM station-keeping and Earthrise. Babcock cut off by CM window frame. Mare Smythii beyond. 80-mm lens. Image credit: Image Science and Analysis Laboratory, NASA-Johnson Space Center. AS11-44-6639 - LM station-keeping and Earthrise. Babcock cut off by CM window frame. Mare Smythii beyond. 80-mm lens. Image credit: Image Science and Analysis Laboratory, NASA-Johnson Space Center. AS11-44-6640 - LM station-keeping and Earthrise. Mare Smythii beyond LM. LM is performing a roll. 80-mm lens. Image credit: Image Science and Analysis Laboratory, NASA-Johnson Space Center. AS11-44-6641 - LM station-keeping and Earthrise. Mare Smythii beyond LM. LM is performing a roll. 80-mm lens. Image credit: Image Science and Analysis Laboratory, NASA-Johnson Space Center. AS11-44-6642 is one of the most famous Apollo photographs. 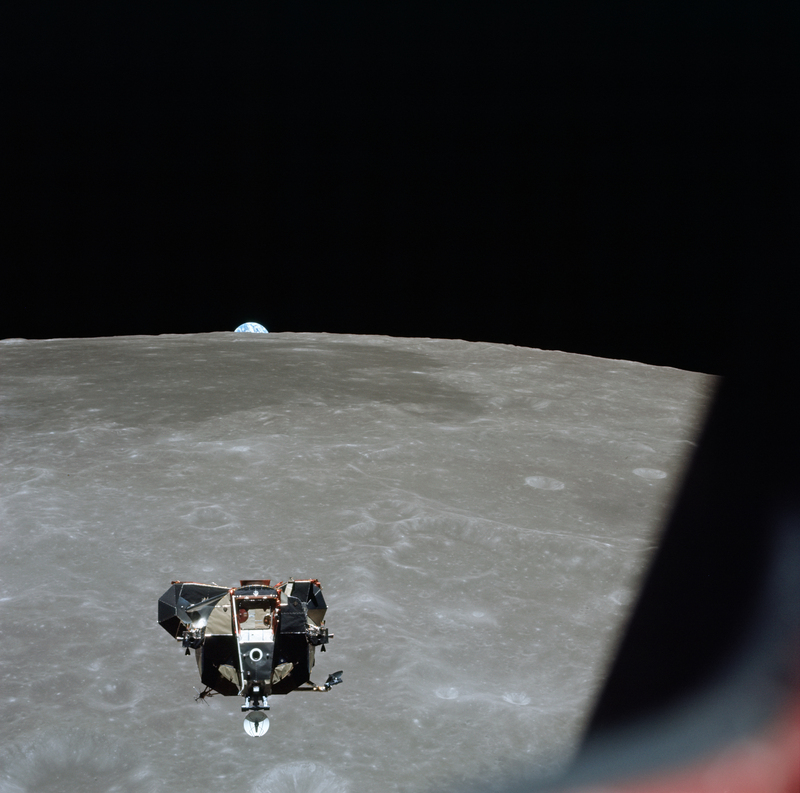 Mike was particularly pleased with the fact that he had managed to get all four players in the story into one image; Earth, Moon, Eagle and with the edge of the Command Module's window visible, Columbia. AS11-44-6642 - LM station-keeping and Earthrise. Mare Smythii beyond LM. LM is performing a roll. 80-mm lens. Image credit: Image Science and Analysis Laboratory, NASA-Johnson Space Center. AS11-44-6643 - LM station-keeping and Earthrise. Mare Smythii beyond LM. LM is performing a roll. 80-mm lens. Image credit: Image Science and Analysis Laboratory, NASA-Johnson Space Center. 127:51:42 Armstrong: Okay. You've got me. 127:52:00 Evans: Eagle and Columbia, Houston. Standing by. 127:52:05 Armstrong: Roger. We're station-keeping. 127:52:24 Aldrin (onboard): Pitch up [garble] pass right up just a little, you got a better view - bottom side - [garble] - move back. 127:52:45 Collins (onboard): [Garble] - that's right. 127:53:21 Armstrong (onboard): That roll's pretty far. I don't know just how much - so that's - Oh, it's going to go Block! 127:53:28 Aldrin (onboard): That's it - going to AGS? 127:53:32 Armstrong (onboard): Yes, [garble] Att Deadband. 127:54:54 Armstrong: I'll stop. Matter of fact, I can stop right here, if you like this. 127:54:59 Collins (onboard): Need a little bit more. That's the way, keep it going. Need a little more [garble]. That's the way, keep going - go a little bit more - go ahead - go ahead - okay, stop. Okay, I got it now. 127:55:27 Aldrin (onboard): You got the [garble] in [garble]? 127:55:55 Aldrin (onboard): Well, we might need to at least have a platform [garble]. 127:56:27 Collins (onboard): Okay, now, Neil, when you feel us contact, you're going to turn [garble] seconds, is that right? 127:56:30 Evans: Eagle, Houston. Middle gimbal. And you might pass to Columbia, we don't have him yet. While making an unplanned attitude adjustment, Neil has placed Eagle's inertial platform into the gimbal lock condition. Armstrong, from 1969 Technical debrief: "We stopped braking phase at 50 to 100 feet, ensured that both vehicles were in a docking configuration, and at this point, we ran into a problem that we wouldn't have anticipated preflight. Our procedure was for the LM to get into station-keeping position 40 feet out in front of the Command Module plus X-axis, pitch over 90 degrees so that the X-axes are colinear, then yaw left 60 degrees so that we are in the docking attitude with the Command Module. It was obvious when we got to this point, if we pitched the LM over 90 degrees, we would be looking directly into the Sun. We knew that would be an unsatisfactory lighting condition for docking. So the alternative would be to roll the LM 60 degrees, pitch down, and then you'd be in the same attitude and would have prevented the Sun coming into the window. 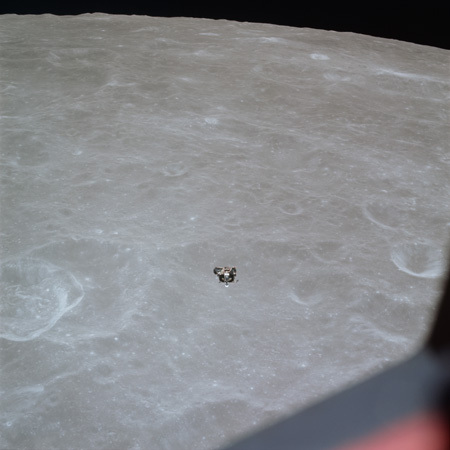 After arriving at that attitude, a discussion between the LM and the Command Module indicated that we weren't quite far enough, so I rolled a little farther, pitched over, and waited looking through the top window. We were asked to rotate a little farther by the Command Module to line up the docking aids and get the proper alignments. We complied and promptly maneuvered the vehicle directly in the gimbal lock. I wasn't aware of it because I was looking out the top window. No doubt, we were firmly ensconced in gimbal lock. We had all the lights on, the DAP was not operating anymore, we had no control outputs, clearly no CDU outputs were being processed, so we just put it in AGS and completed the docking in AGS." Aldrin, from 1969 Technical debrief: "And I don't think the AGS is a good system to dock in, or PGNS either." Armstrong, from 1969 Technical debrief: "This was just a goof on our part. We never should have arrived at the conclusion from any series of maneuvers. However, that's how it happened. It wasn't significant in this case, but it certainly is never a desirable thing to do. There's nothing catastrophic about it here, but I'm sorry that somehow or other we hadn't studied the docking maneuver a little bit more carefully and recognized that there might be some attitude constraints in the maneuver that we hadn't considered." 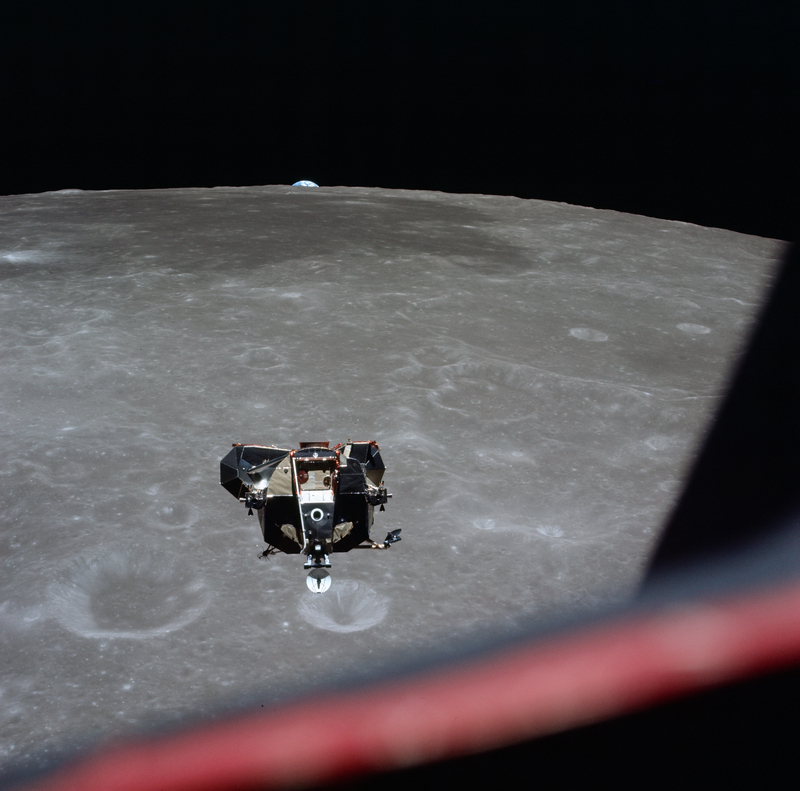 Aldrin, from 1969 Technical debrief: "The few times that we'd done that previously we ended up approaching docking with the Sun more along the line of sight to the two vehicles. This was more our concern, arriving at the docking point a little bit late. If you arrive there a little late and the line-of-sight motion happens to be such, the Sun is going to be pretty close to where the Command Module was. In this particular case, it was about 90 degrees away. After getting in that attitude (or getting docked), to have a PGNS operating, I aligned it to zero and went through the quick alignment procedure. I got the PGNS back in operation again and figured it was not a known REFSMMAT. There were no postdocking maneuvers planned by the LM, so to get both systems the same, I then aligned the AGS to the PGNS. Both of them lost their reference, but both of them were 00 and as far away from any future gimbal lock as they could be. That might have been a better way to operate anyway." 127:56:34 Collins (onboard): Okay, Buzz. 127:57:12 Aldrin (onboard): We got a platform to make. 127:57:55 Armstrong (onboard): I think we ought to be at 4 jets for this, [garble] AGS. 127:58:42 Armstrong (onboard): He's about 15 feet out now. 127:58:45 Aldrin (onboard): Okay, I'd better try out the radar. 127:58:52 Armstrong (onboard): Don't you want to beef up that radar? 127:59:06 Armstrong (onboard): Ready to pull the circuit breakers? 127:59:08 Aldrin (onboard): Okay. You ready? 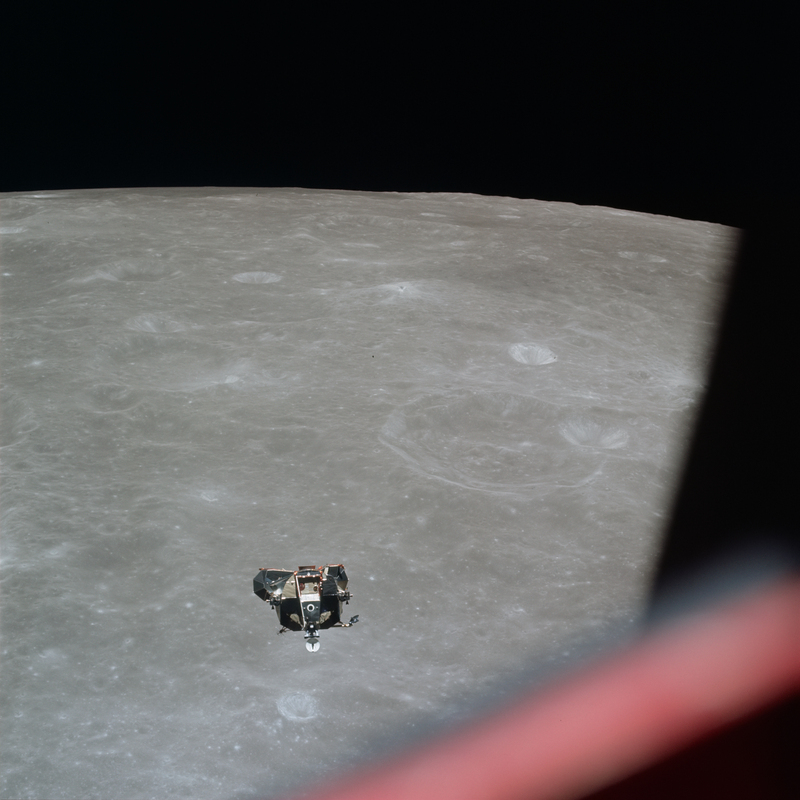 127:59:12 Aldrin (onboard): They're pulled. 127:59:14 Armstrong (onboard): He's 10 feet. About 5 feet, I guess. 127:59:23 Armstrong (onboard): Looks good, Mike. 127:59:35 Aldrin (onboard): Okay, they're pulled. 127:59:39 Armstrong (onboard): Pull it out. The moment of docking is given in the Apollo 11 Mission Report as 128:03:00. It hasn't gone quite as expected. Neil has the LM holding its attitude using the AGS. When Mike docks with it and retracts the probe, the AGS senses the attitude change and begins to fight it. The complex dynamics cause the LM and CSM to go out of alignment so that when the retraction completes and the docking rings meet, they do so at an angle. 128:04:29 Collins: That was a funny one, you know. I didn't - I didn't feel a shock, and I thought things were pretty steady. I went to Retract there, and that's when all hell broke loose. [Pause.] Were you guys - did it appear to you to be - that you were jerking around quite a bit during the retract cycle? 128:04:50 Armstrong: Ah yeah. It seemed to happen at the time I put the plus-X thrust to it, and apparently it wasn't centered, because somehow or other I accidentally got off in attitude and then the attitude hold system started firing. Collins, from 1969 Technical debrief: "Docking we did in CMC, Auto, narrow deadband under DAP control. Neil made the crude alignments to get the correct side of the LM pointed toward the COAS. Then I made the final adjustments. I estimated that I contacted the LM just about exactly dead center and at a slow but adequate closing velocity. I would guess slightly in excess of 0.1 ft/sec. Despite this fact, I couldn't tell the instant of contact. The empty ascent stage is light enough relative to the Command Module that when the two vehicles touch, it's just sort of like pushing into a piece of paper. The LM recoiled enough that they could feel it in the LM, but I couldn't really feel it in the Command Module. I thought I was getting there, and I thought I was getting there, and I finally was fairly sure I had contact. I looked up for the third or fourth time, and I did have two barberpoles indicating that the capture latches had made. At this time, I looked out the window, and the situation appeared static. I threw the switch from Auto to Free, so that I was in CMC, Free. I looked out the window again - this was all going pretty fast now - I would say this was 3 seconds after contact. The situation looked like it had previously; that is, the two vehicles were statically joined together with no motion. At that time , I fired the bottle. No sooner did the bottle fire than a yaw gyration started between the two vehicles. I'm not sure whether it was a result of the retract cycle beginning or whether it was a result of the LM firing thrusters toward me. At that time, this static situation became very dynamic, and a fairly large yaw excursion took place. I would say that relative to the LM I rapidly went to about a 15-degree yaw right angle. I put the CMC, Free switch back to CMC, Auto. This enabled the hand controller in rate command and minimum deadband. I made manual inputs to yaw back over towards the centerline, and there were a couple of other oscillations enroute. I can remember thinking, 'I don't think we're going to get a successful hard dock this time. I'm probably going to have to let the LM go and try again.' About that time, the docking latches fired, and we were hard docked. I would guess that the time interval from firing the bottle to hard dock was about 6 to 8 seconds. This is probably a pretty normal retract time. Things were happening fairly rapidly, and the oscillations had built up almost exactly at the time I fired the bottle which was primary 2." Armstrong, from 1969 Technical debrief: "I can add a few comments here from the other side. At the time we felt the contact - which really was difficult to feel - it was a very low bump sound, or touch in the tunnel; we fired plus X RCS in the LM as per the preflight plan. Shortly thereafter, we also observed significant attitude oscillation. I guess it would be primarily right roll as observed in the LM. We were in AGS Rate Command minimum deadband and, in addition, plus X. As soon as the attitude deviation started, I left the plus X off and called for Buzz to give me Max deadband in the thrusters so we wouldn't be firing a lot of attitude thrusters. Then I took control and manually maneuvered the vehicle back toward colinear status. About that time, it snapped us in there and locked the latches." Collins, from 1969 Technical debrief: "I didn't like the idea of these two vehicles being joined together just by these two [means three] little capture latches. I was in the habit of firing the bottle the first time it appeared; the two vehicles had been joined together and the situation was static. I never gave these oscillations a fair chance to develop. Maybe a better thing to do is delay firing the bottle until you are sure the oscillations are not going to develop. Although it was sort of alarming there for a second or two, this way did work and it was within the envelope. I'm not sure if I had it to do over again that I would do differently. It depends on what caused the oscillations to get started. It could be the thruster firing of the LM or it could be some other cause. If it's the thruster firing of the LM, then you ought to delete the thruster firing on the LM. I'm not really sure you need that thruster firing on the LM." 128:05:19 Collins: Are you hearing me all right? I got a horrible squeal. 128:05:22 Armstrong: Yeah. I agree with that, but we hear you okay. Apollo 11 has re-emerged from the far side of the Moon on the 27th orbit as a single docked spacecraft, no longer using the separate call signs of Columbia and Eagle.